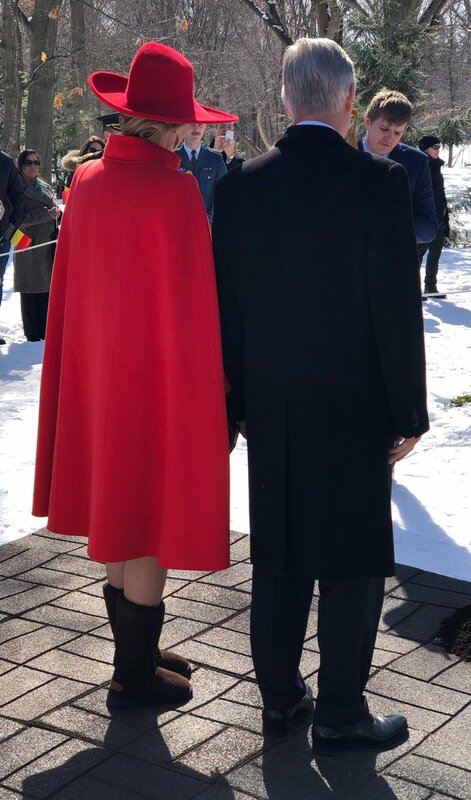 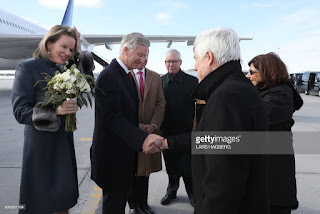 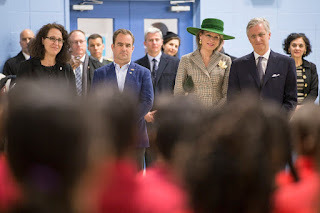 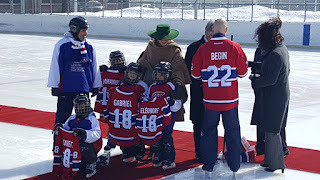 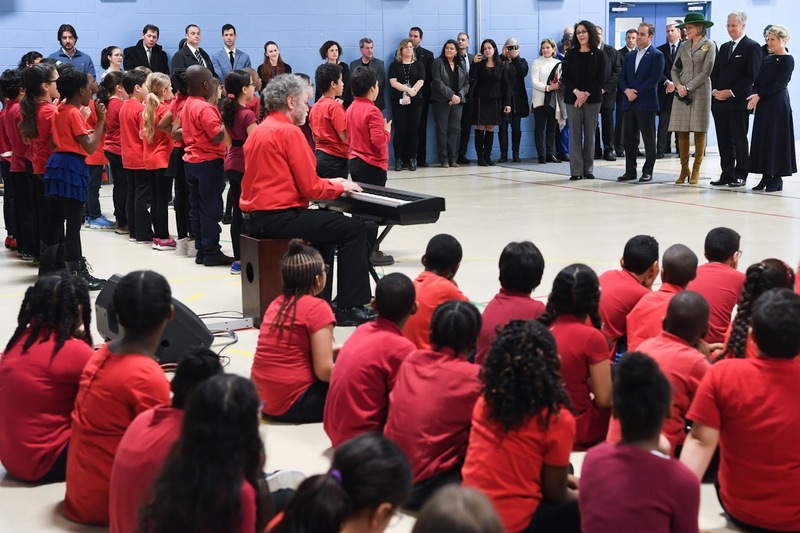 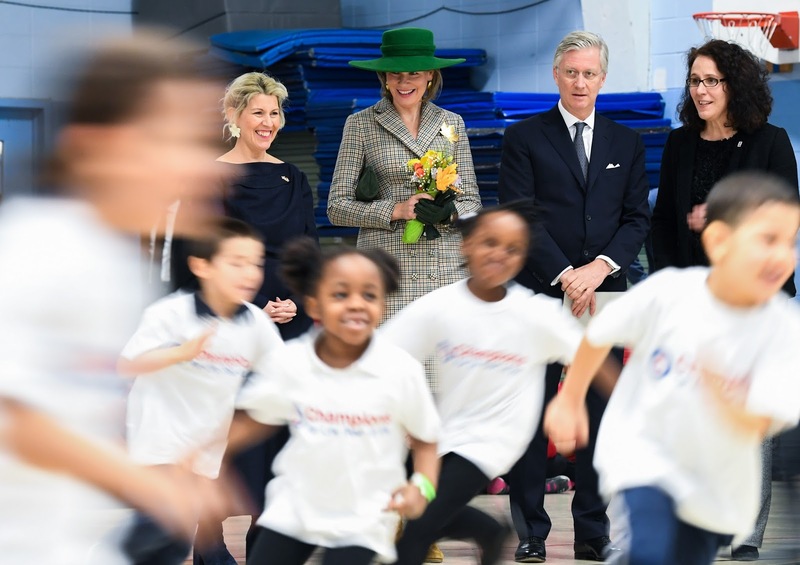 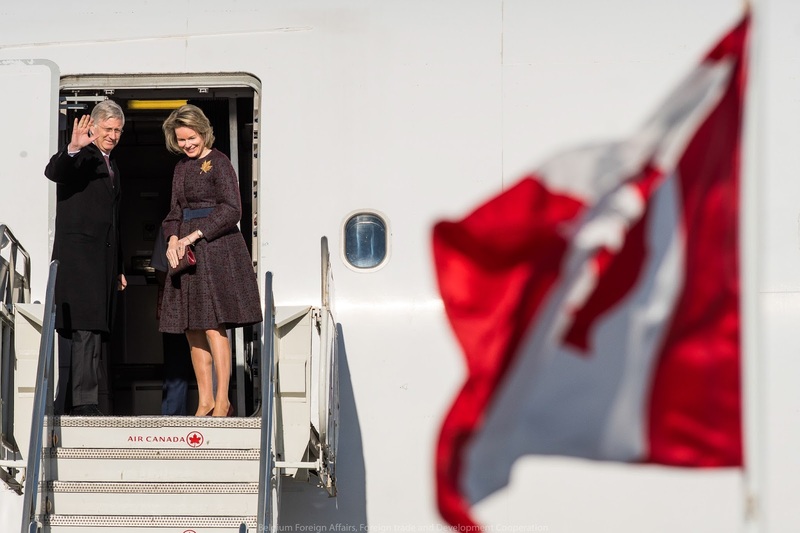 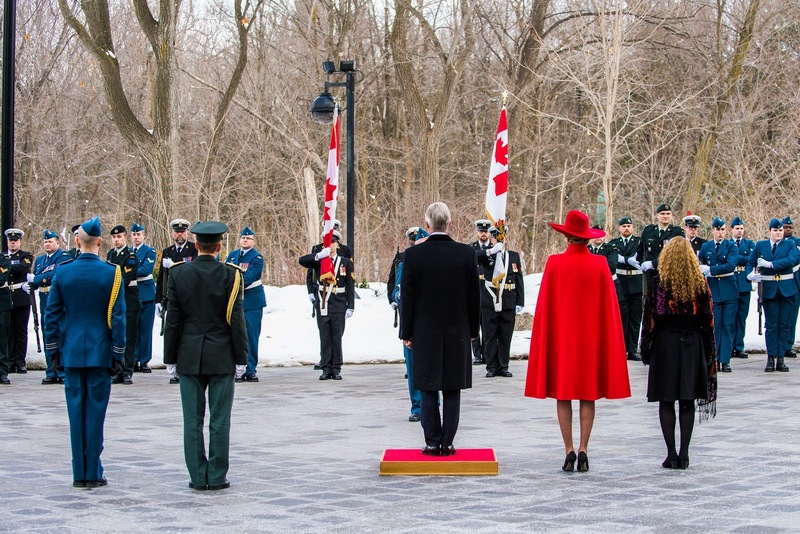 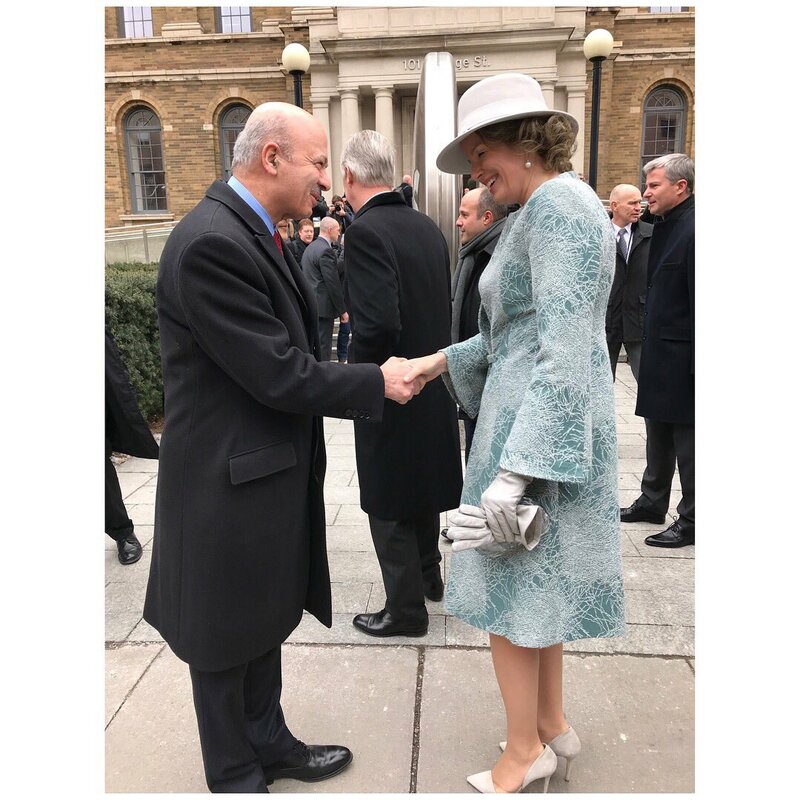 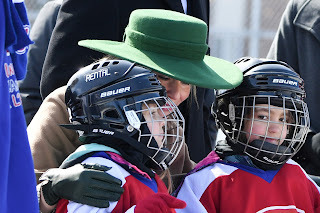 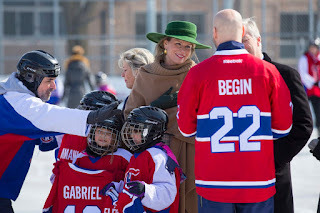 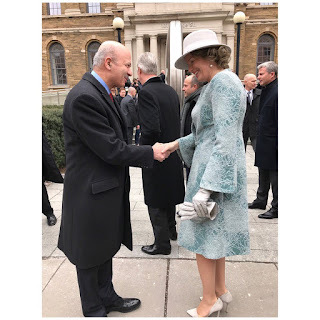 From the 11th until the 17th of March, the royal couple will be visiting Ottowa, Montreal and Toronto as guests of governor-general Julie Payette. 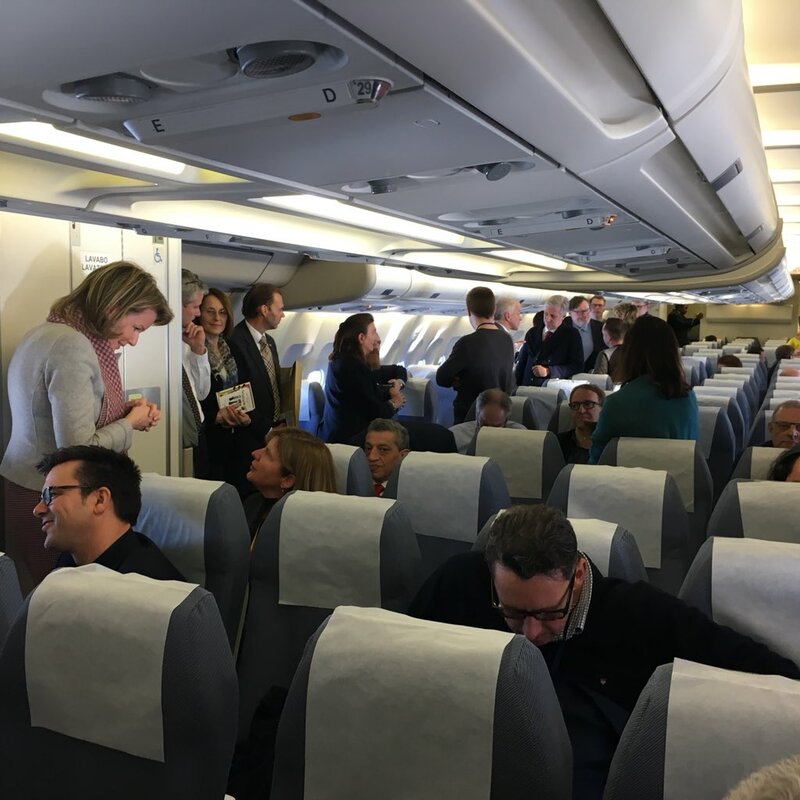 They are heading a delegation of 211 politicians, business men & women, academics and journalists. 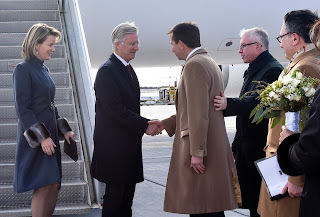 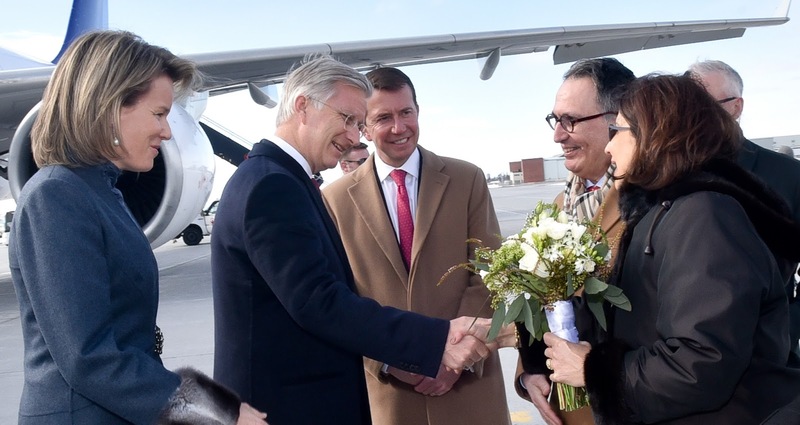 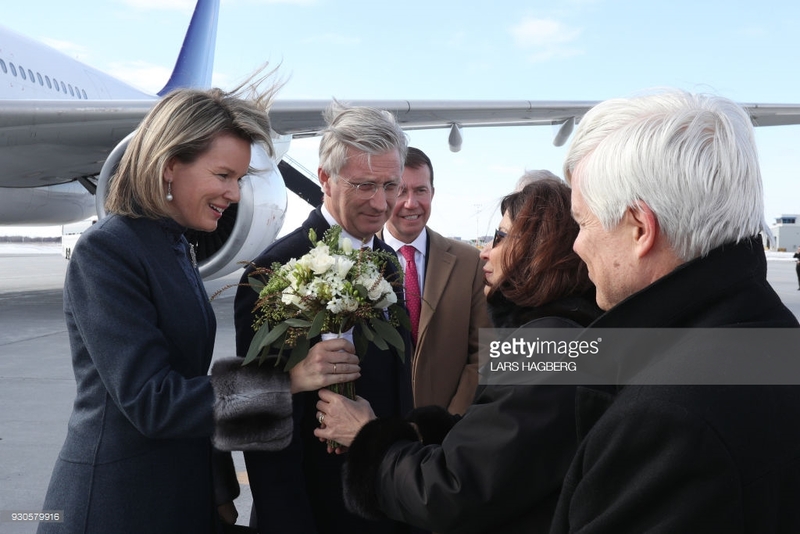 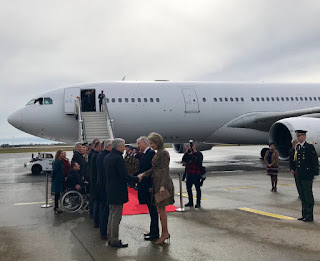 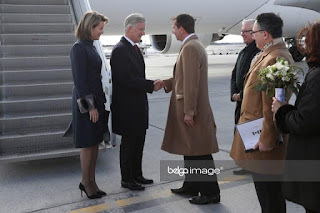 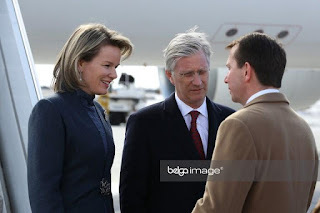 At 12:30 the royal couple and their delegation left from melsbroek military airport. 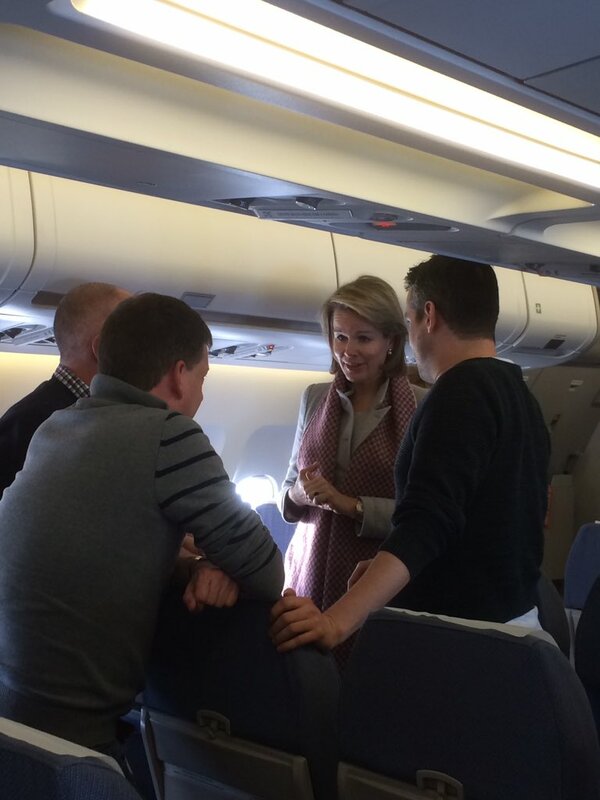 As is her habit, Mathilde had a chat with all of the passengers. At 16:00 local time, they arrived in Ottowa, Canada. 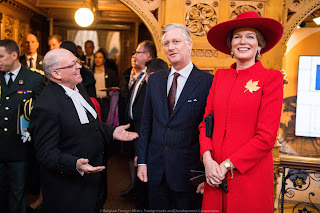 With the Belgian ambassador in Canada, Raoul Delcorde. 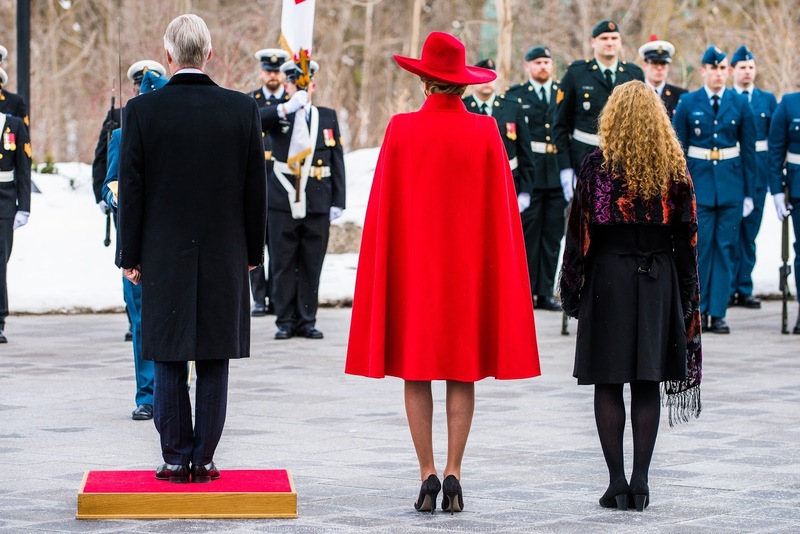 A carriage brought the king and queen to Rideau Hall in Ottowa, where they were officially welcomed by governor-general, Julie Payette. 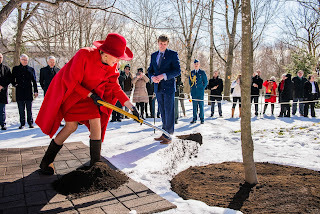 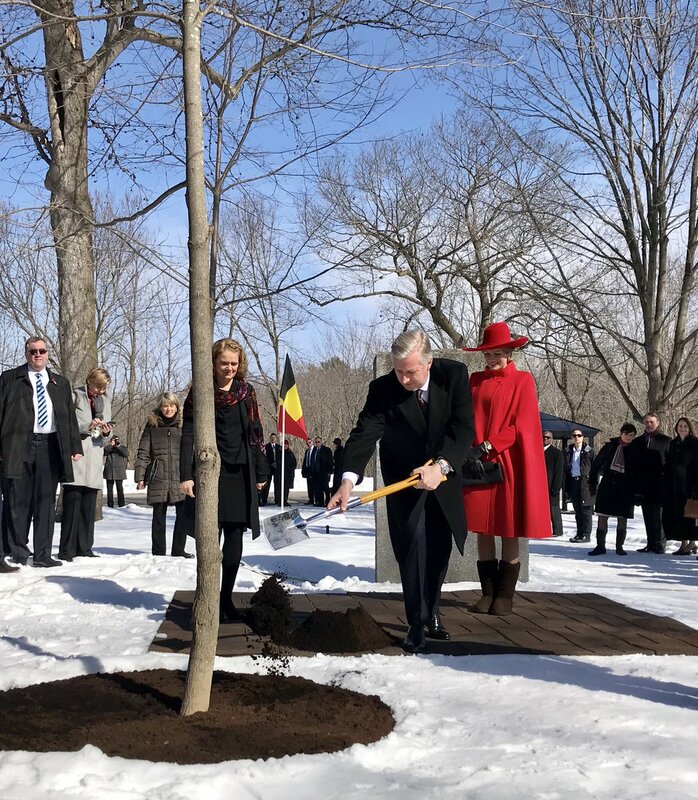 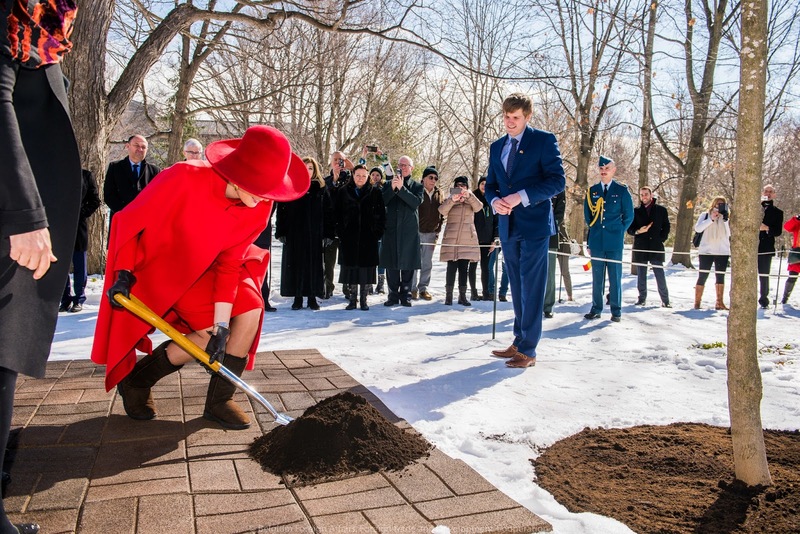 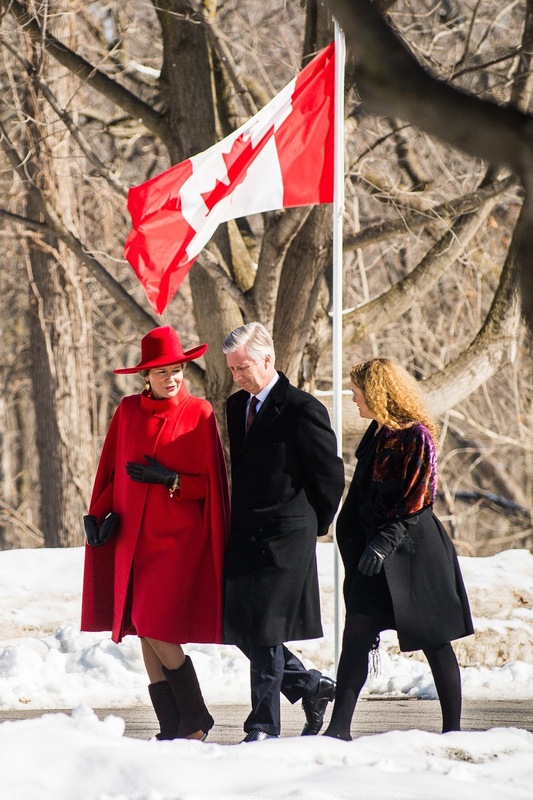 Then the royal couple was asked to plant a tree, as is tradition for each head of state who visits Rideau Hall. 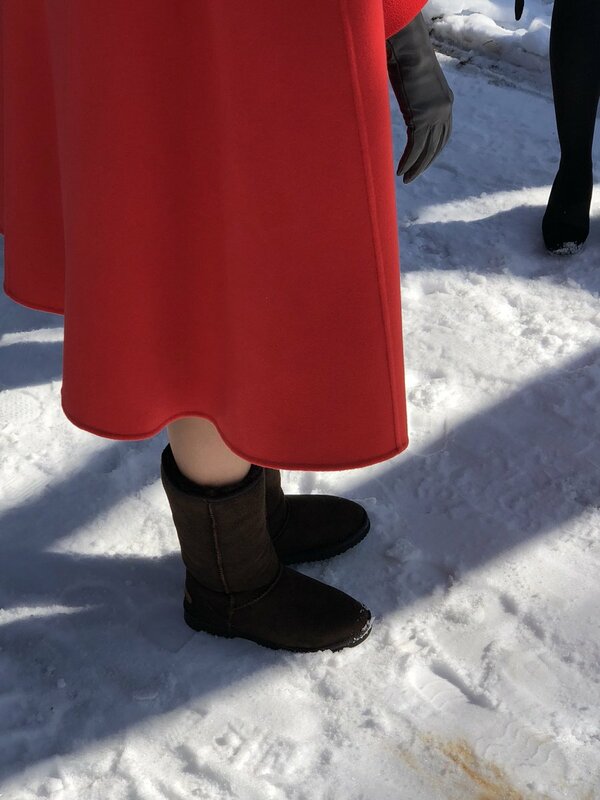 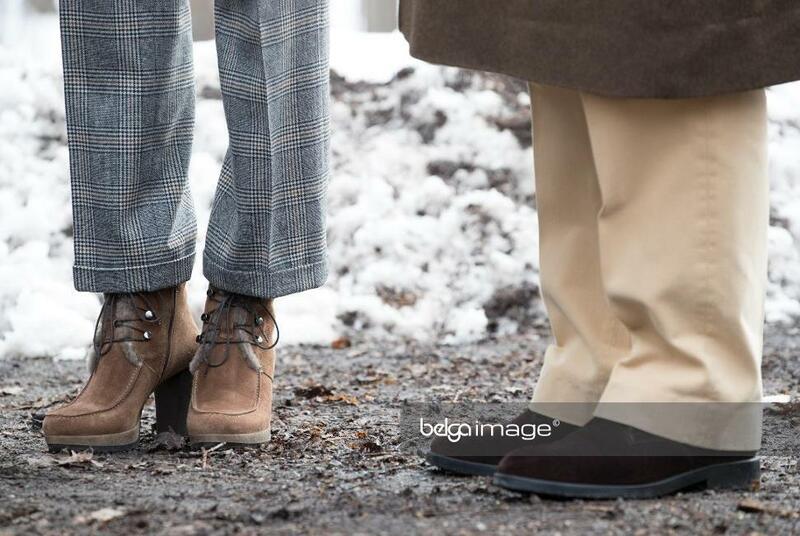 Mathilde traded her Armani pumps for Uggs. They attended the Last Post at the tomb of the Unknown Soldier. 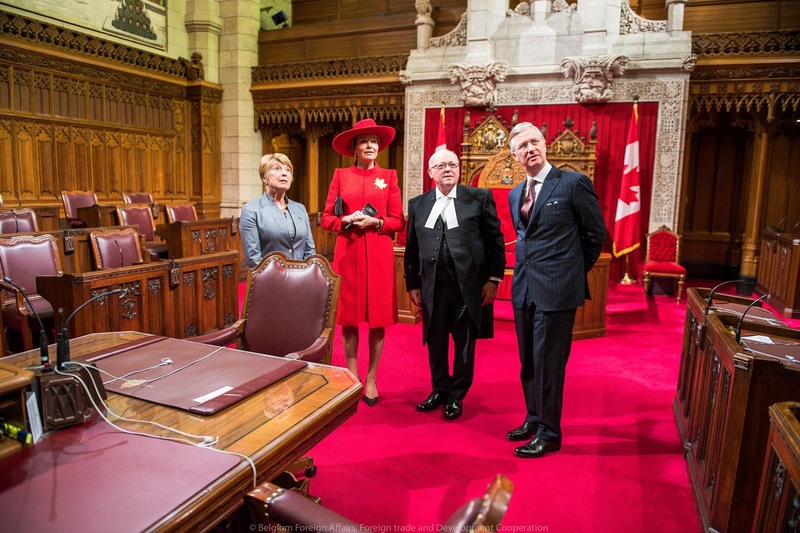 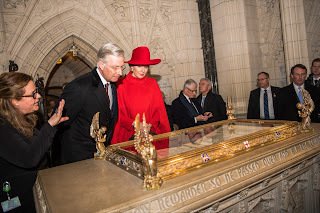 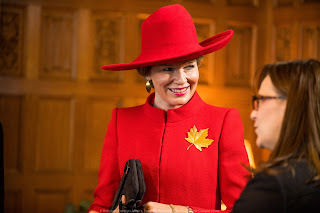 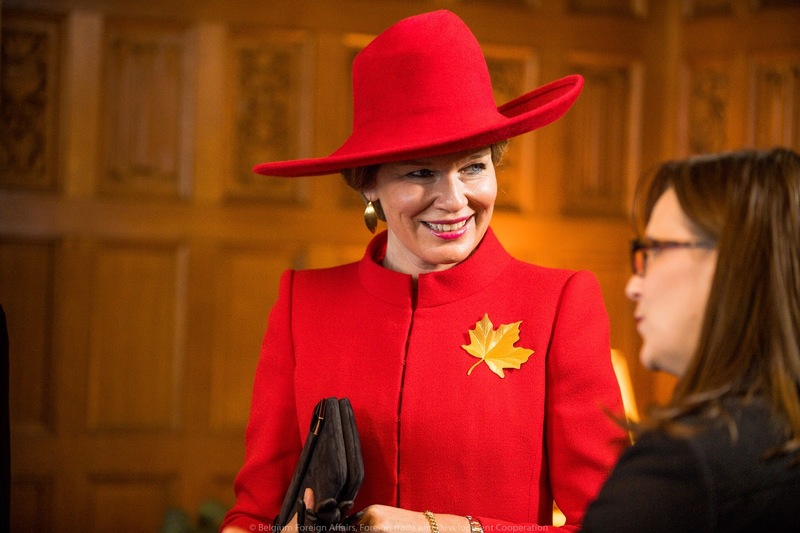 Mathilde was wearing a new maple leaf brooch, custom made by Tikli. 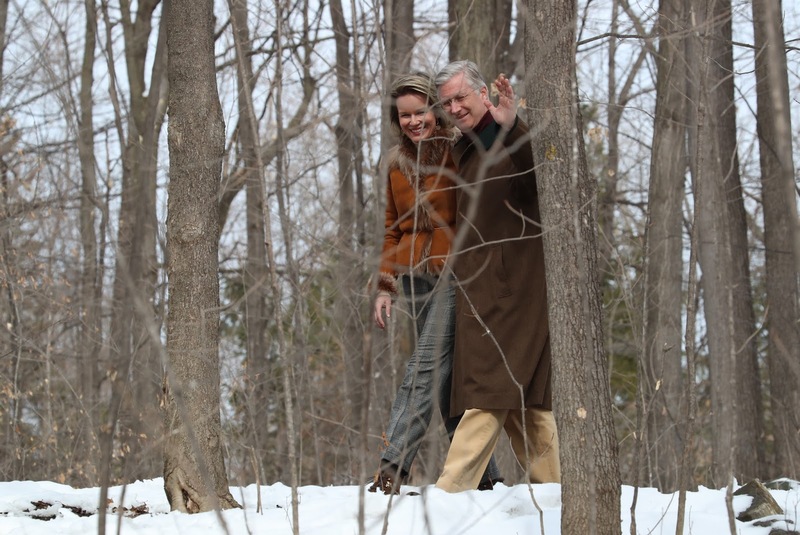 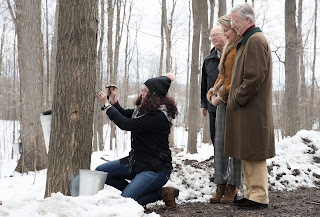 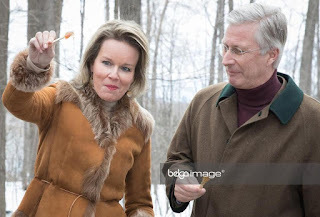 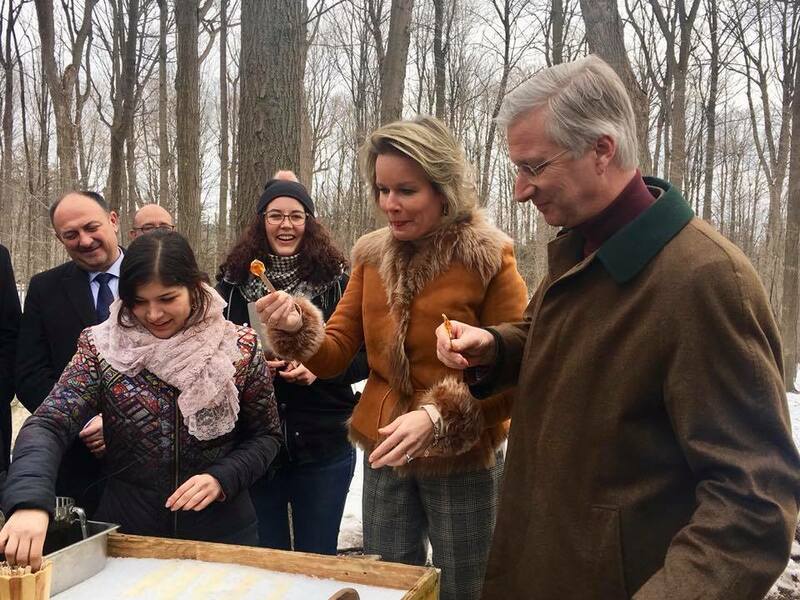 In the afternoon, Philippe & Mathilde were shown a traditional sugar shack, where they got to taste maple syrup. 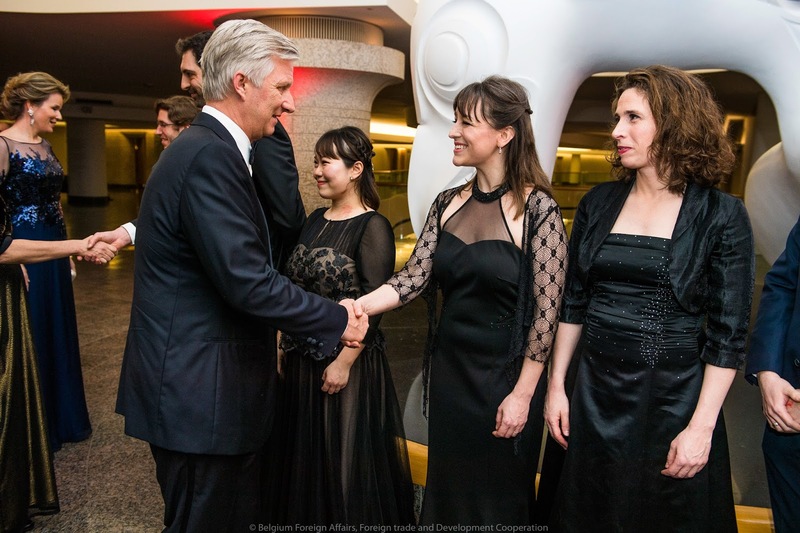 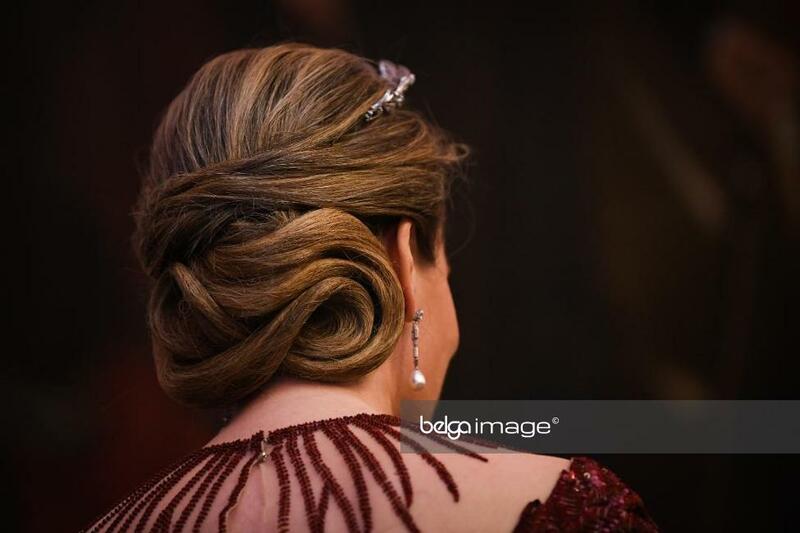 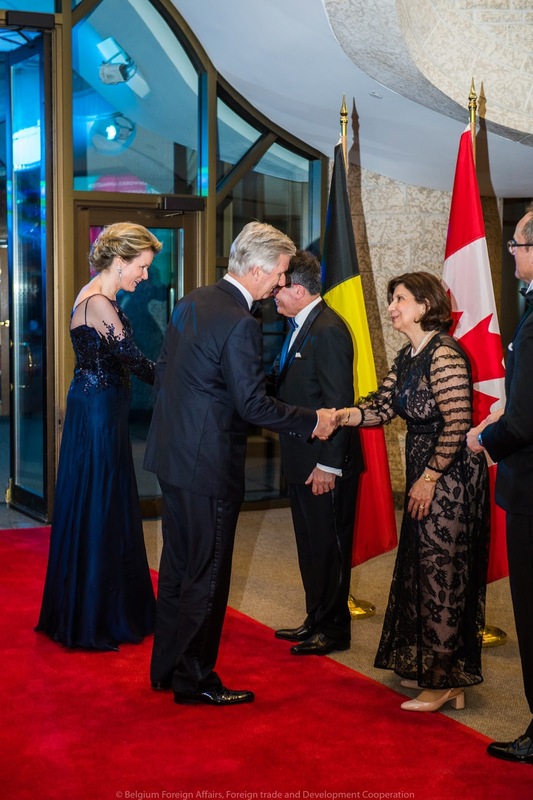 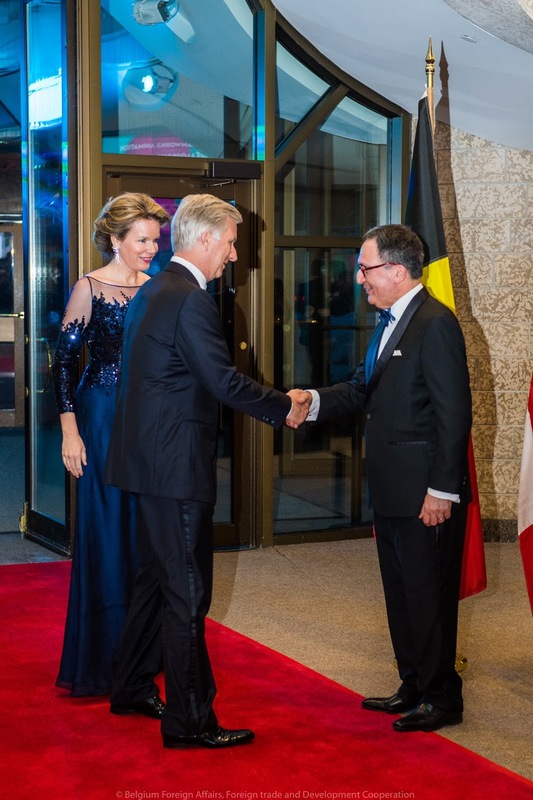 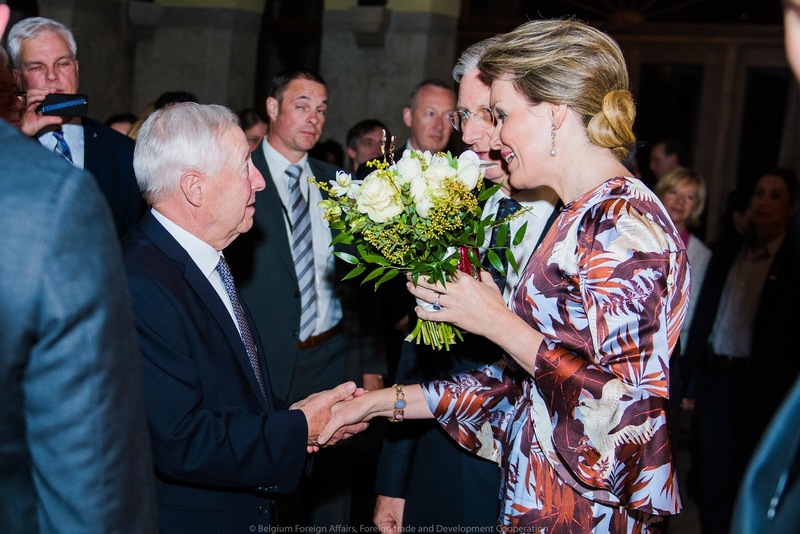 In the evening, Mrs Payette hosted a gala dinner for the Belgian head of state and his delegation. 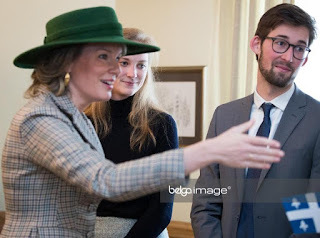 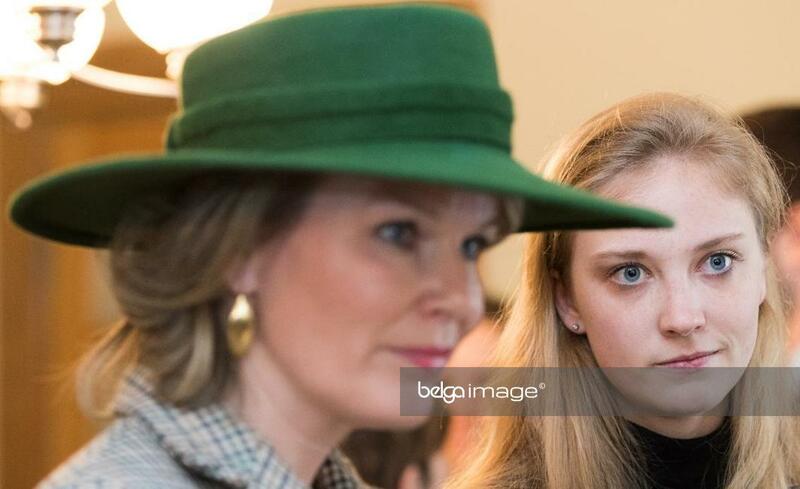 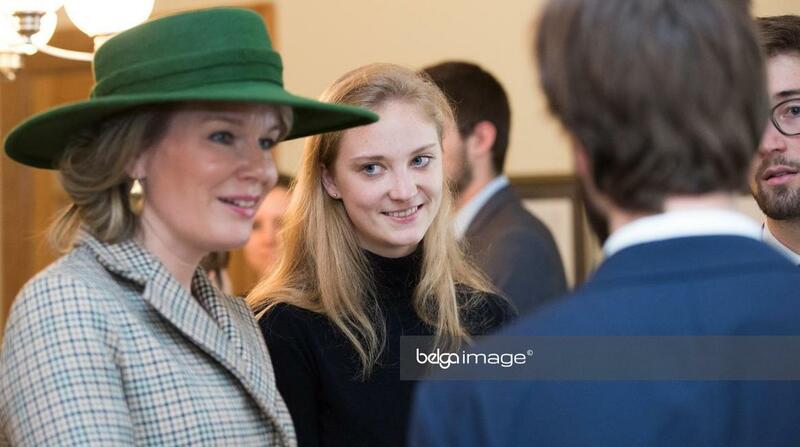 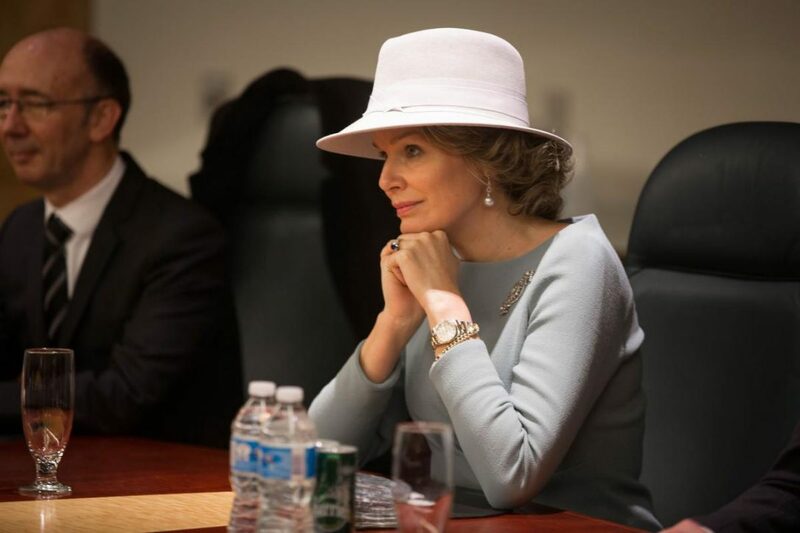 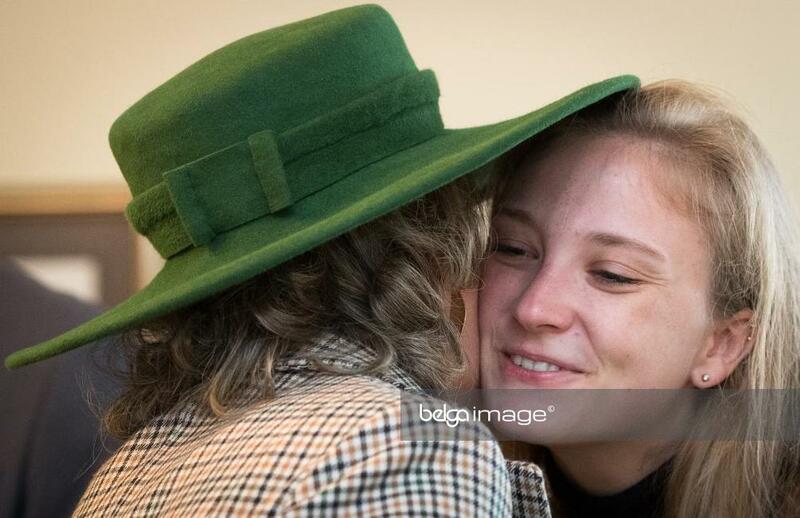 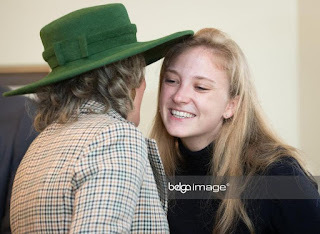 Clotilde Boël is Mathilde's lady-in-witing suring this state visit. 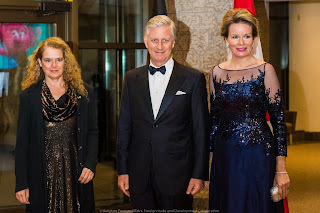 In her speech, Julie Payette reveales she & Mathilde met before, in Thailand. She was also at school with Harold Boël, the millionaire husband of Mathilde's lady-in-waiting, Clotilde Boël. 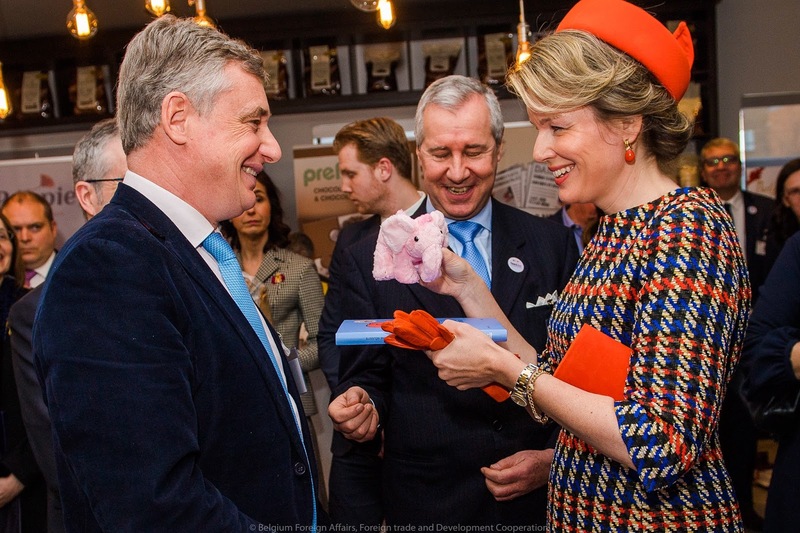 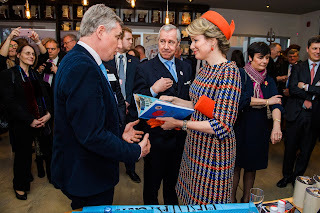 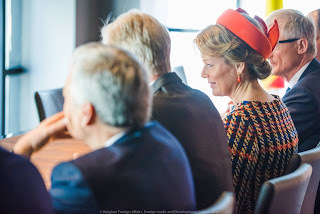 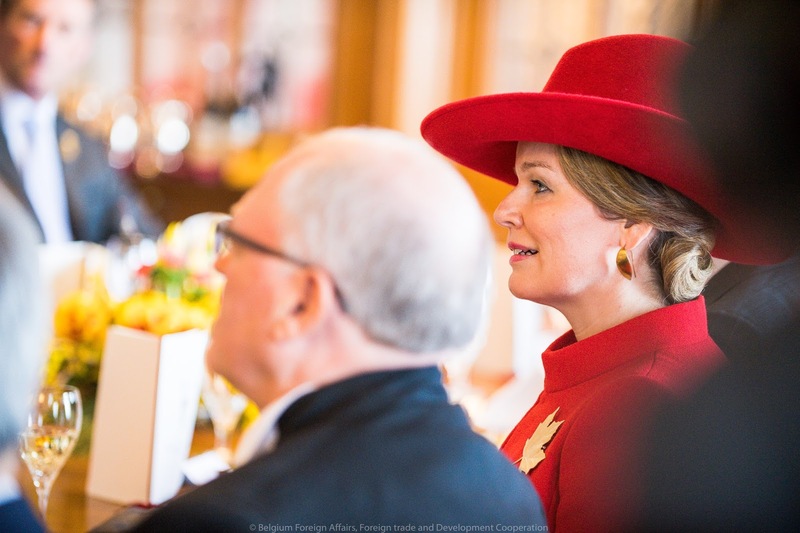 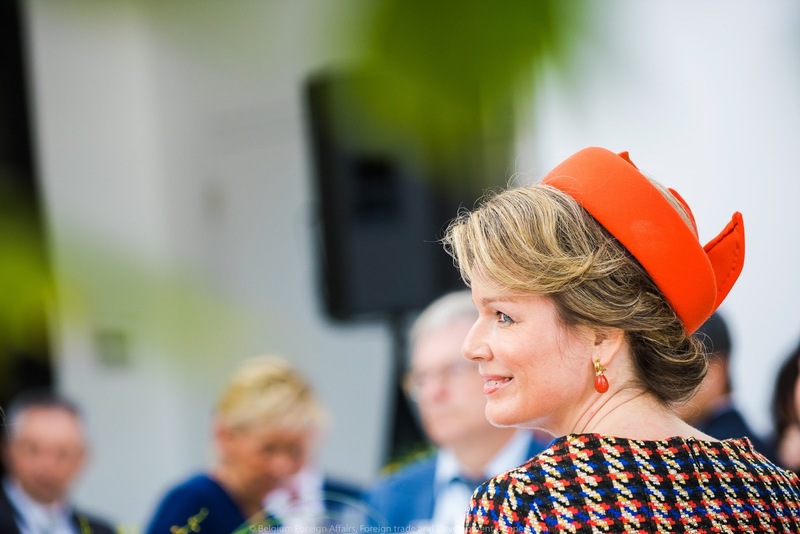 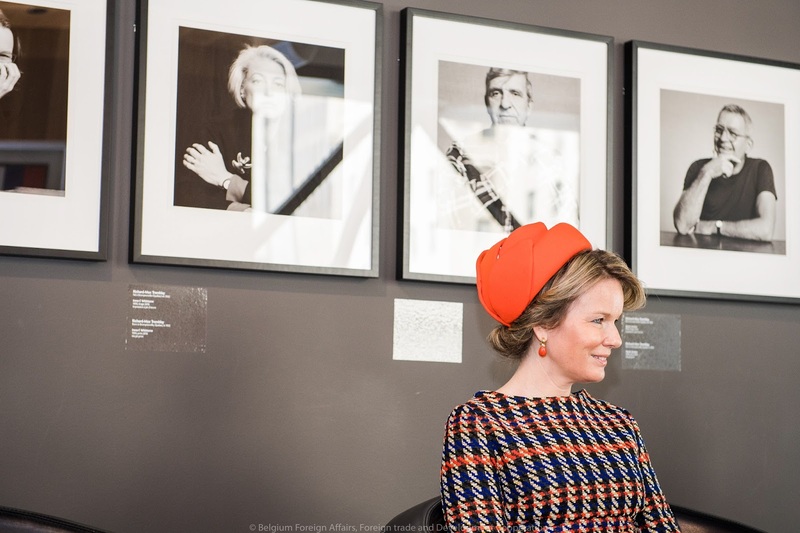 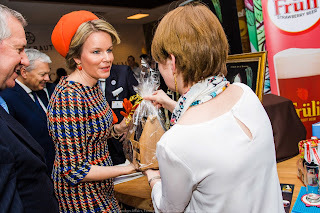 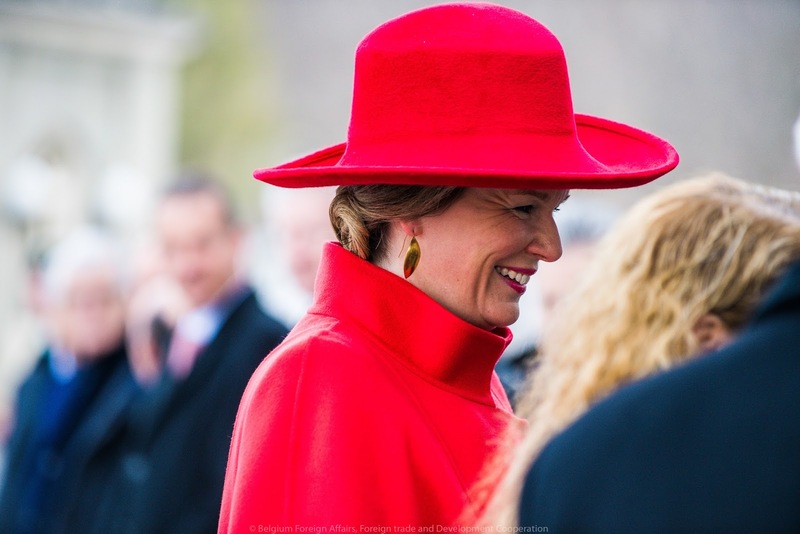 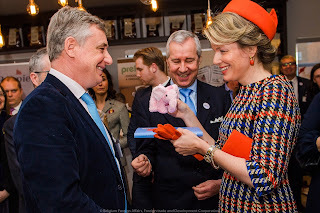 At 9:00 queen Mathilde took part in a breakfast meeting that centered around the SDGs. 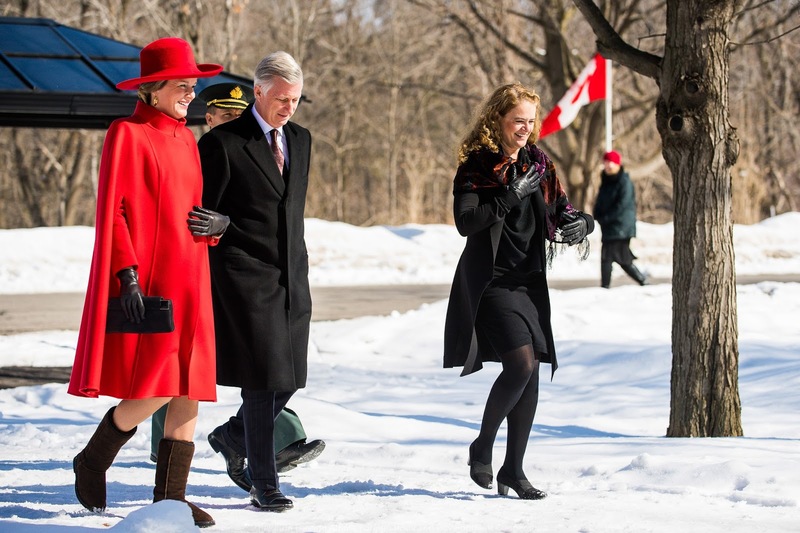 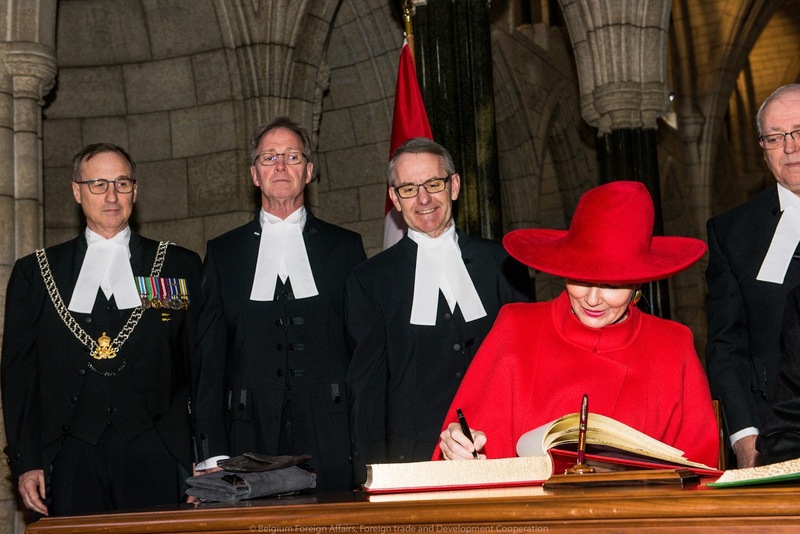 She was joined by Canadian deputy development minister Diane Jacovella. 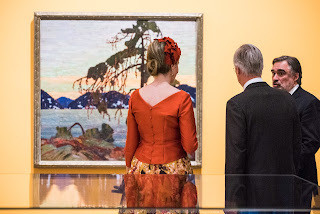 At 11:00 a visit to the National Gallery of Canada was scheduled. 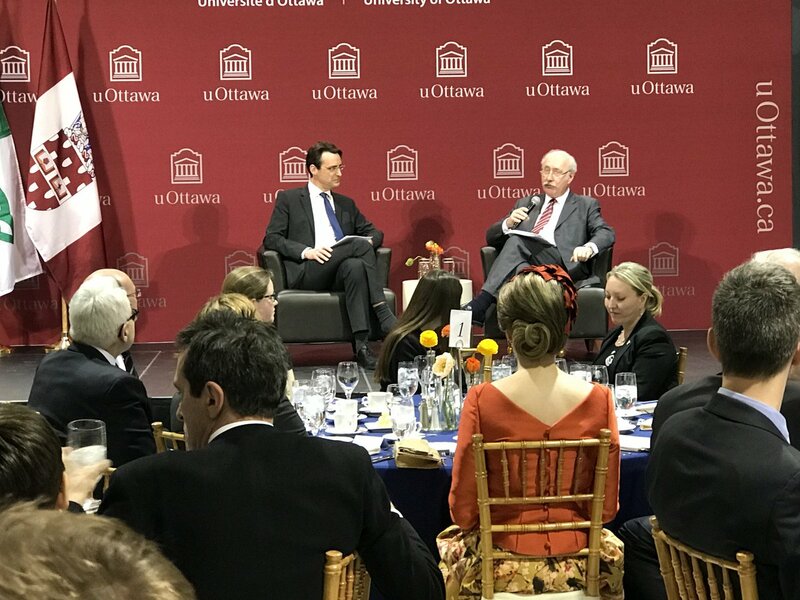 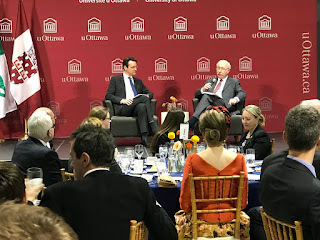 At 12:30 the king & queen attended a seminar on the advantages of multilinguisim in education, at the university of Ottawa. 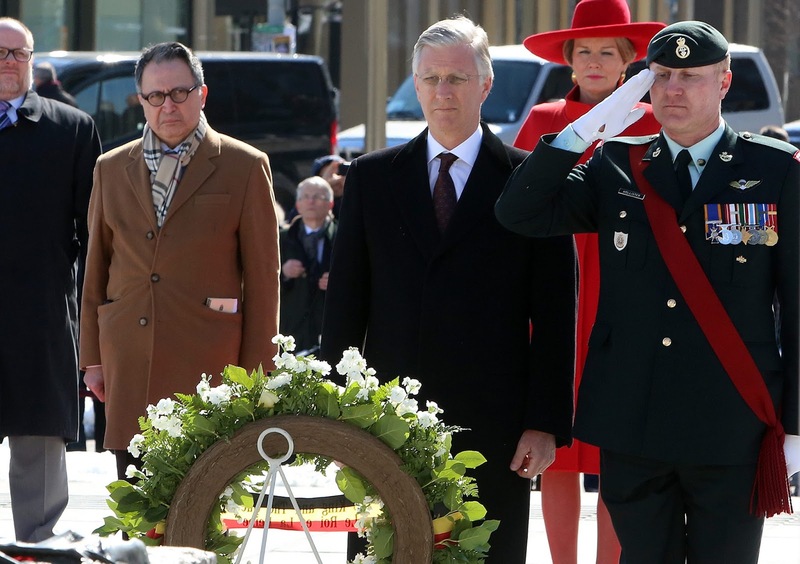 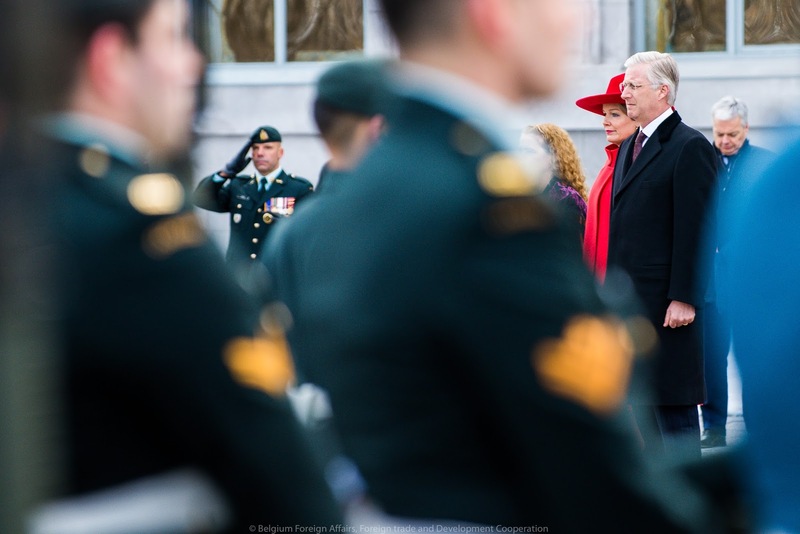 At 15:00 Philippe & Mathilde attended a WWI remebrance activity. 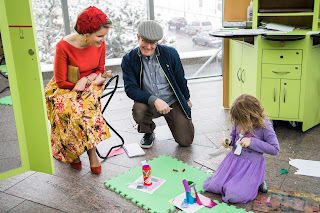 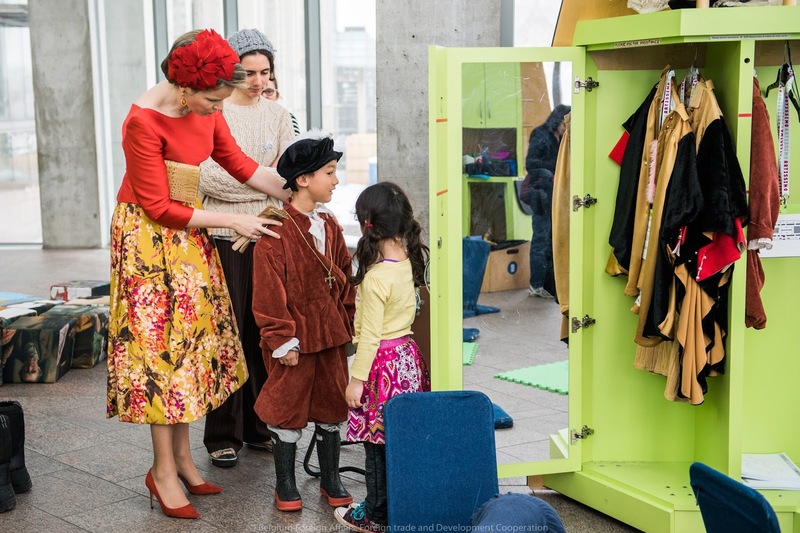 At 16:30 there was a 'diamond experience' at the Canadian Museum of Nature. 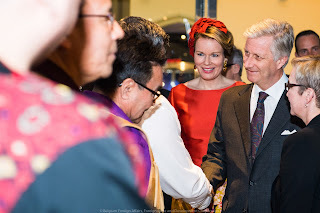 They were welcomed by First Nation chief Georges MacKenzie of the Tlicho government. 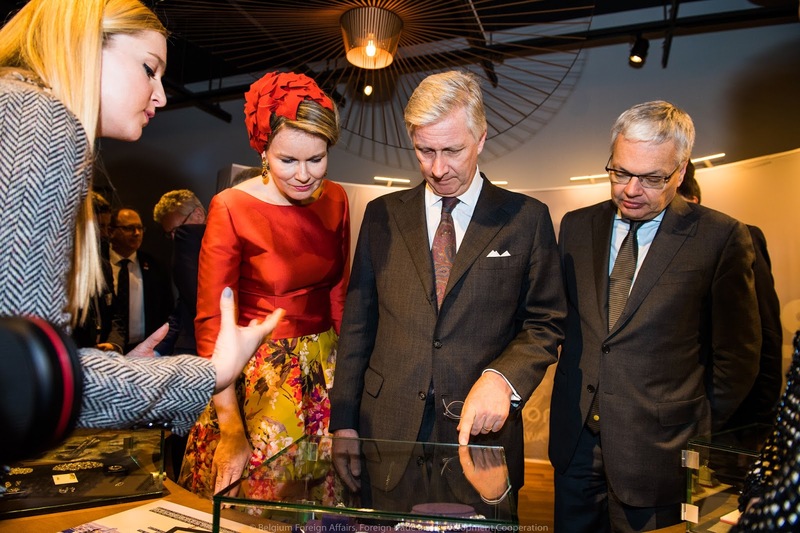 An explanation followed about traditional diamond mining techniques & nature preservation. After king Philippe's address, professor Sophie De Schaepdrijver gave a speech. 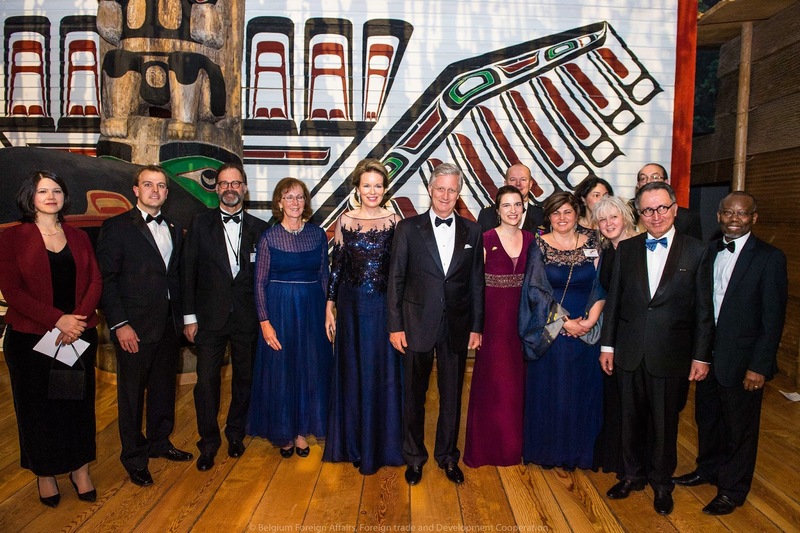 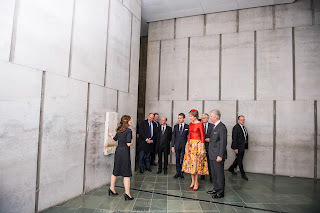 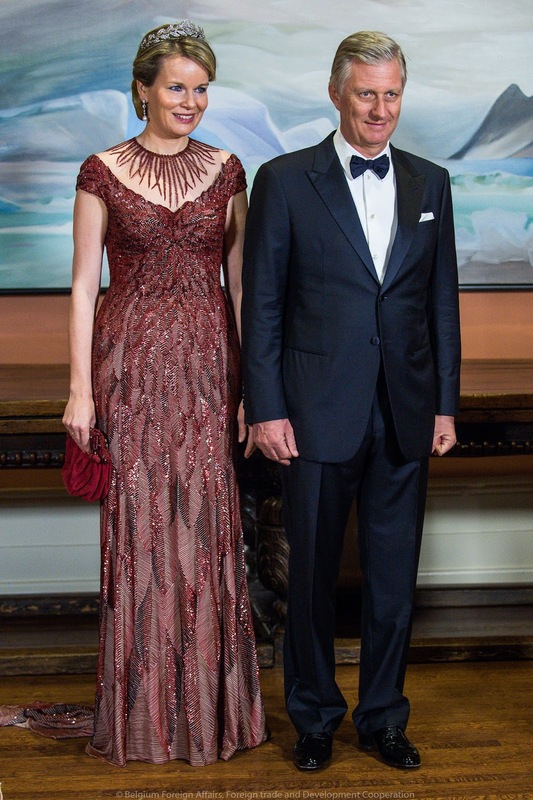 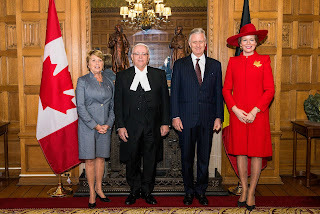 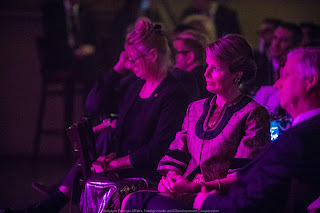 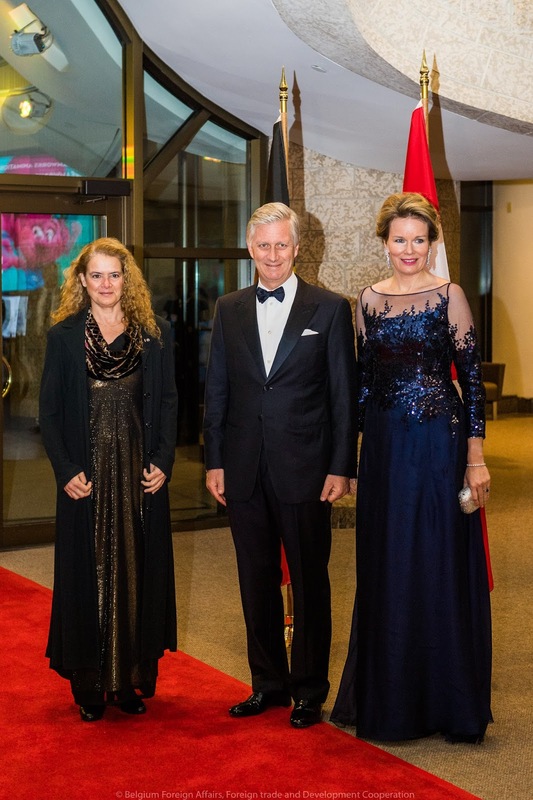 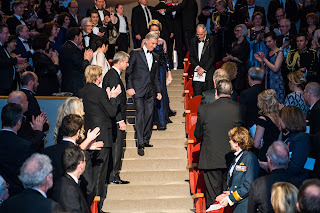 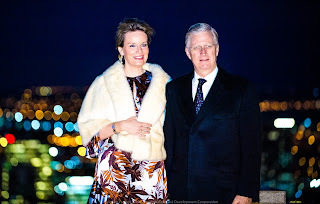 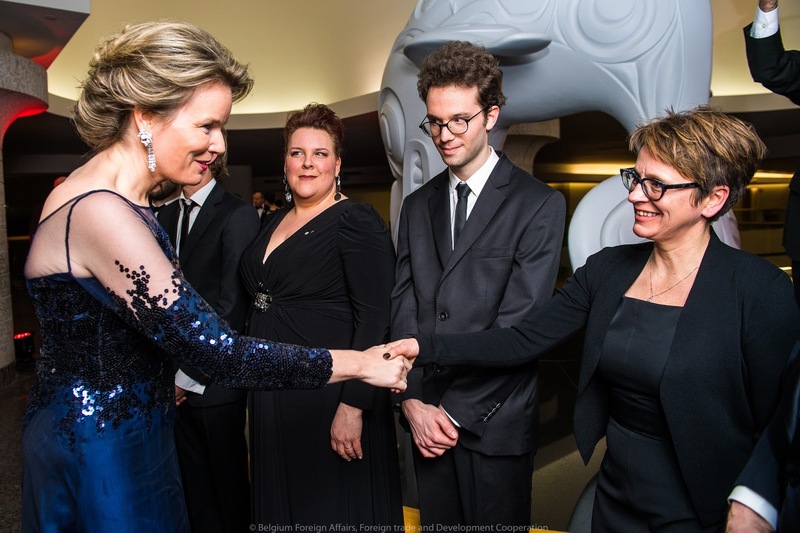 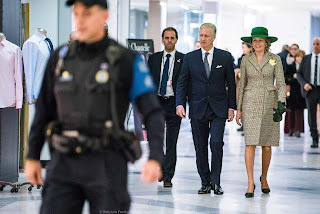 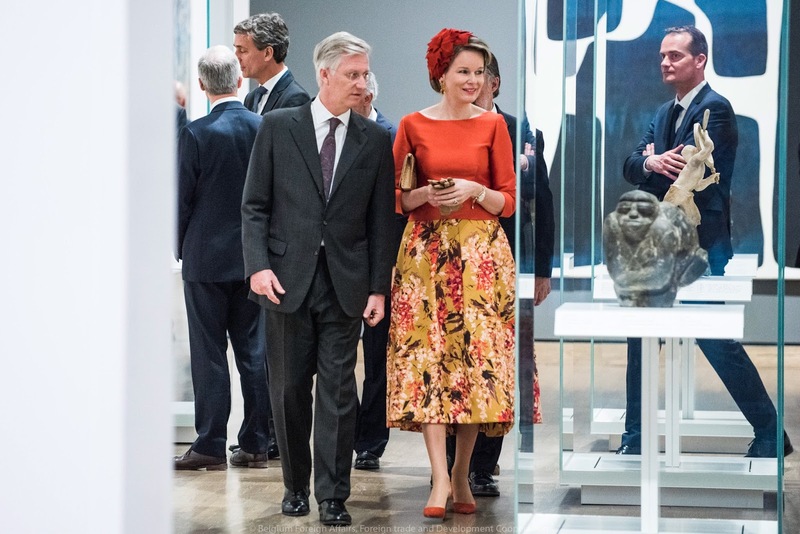 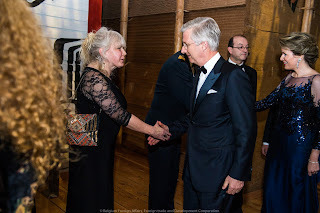 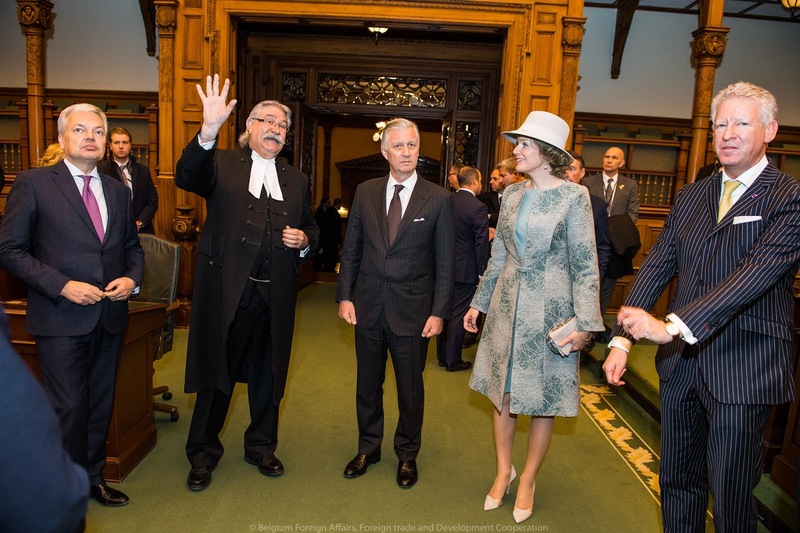 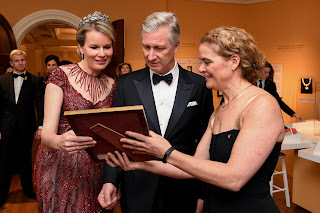 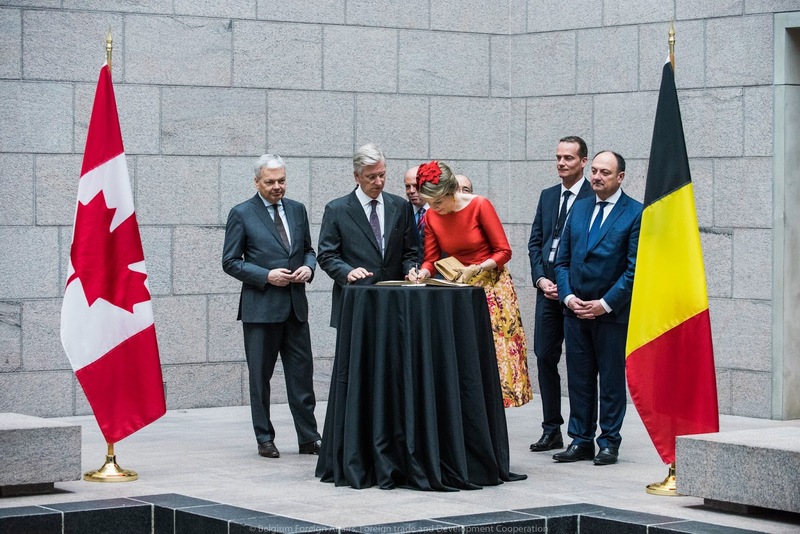 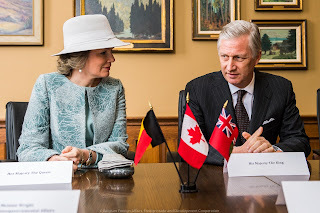 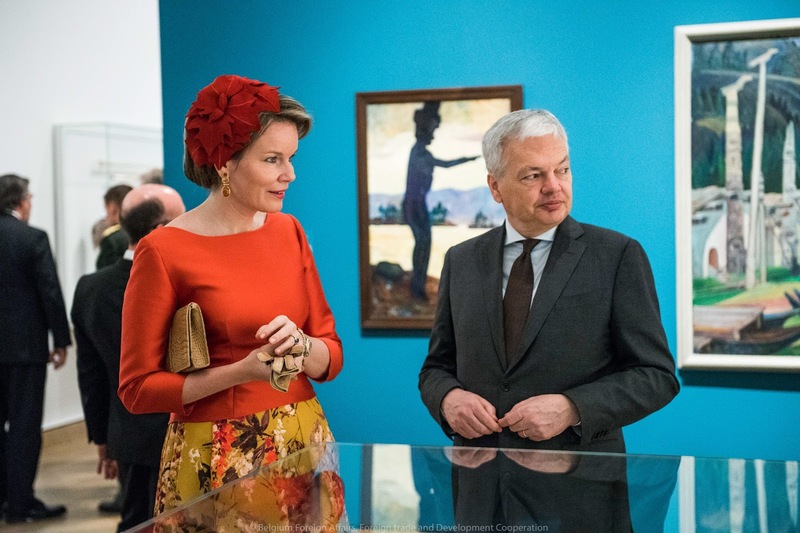 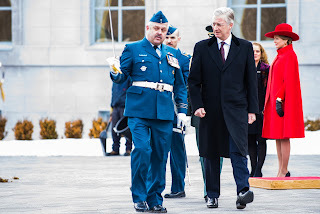 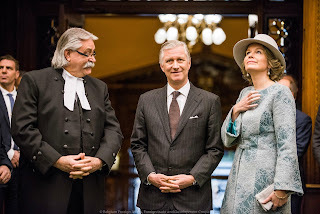 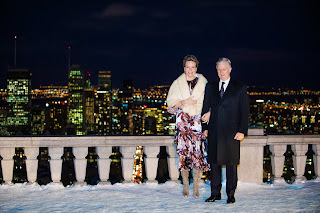 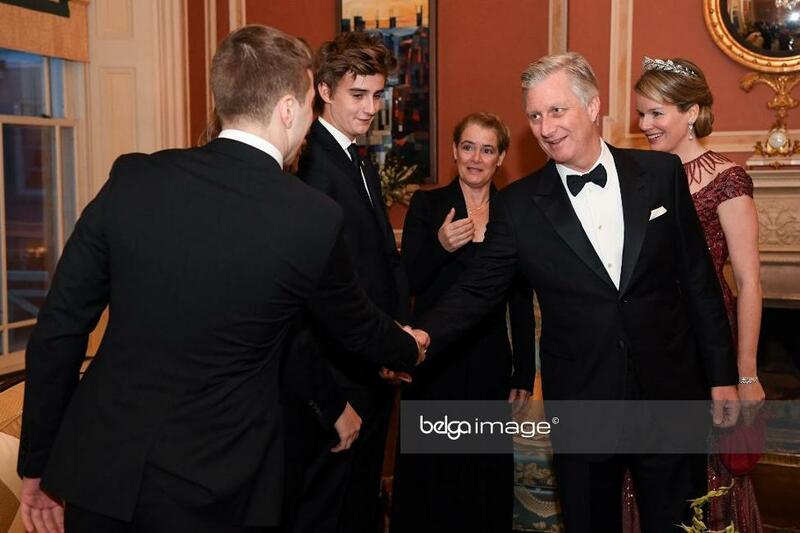 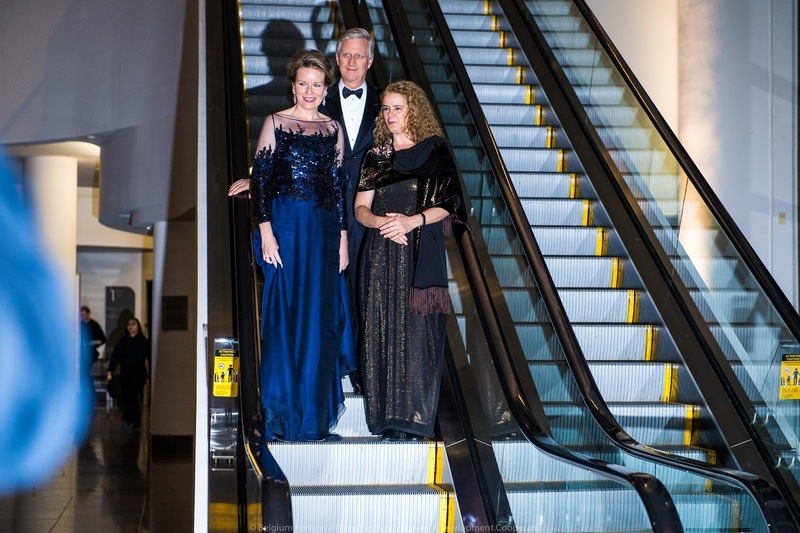 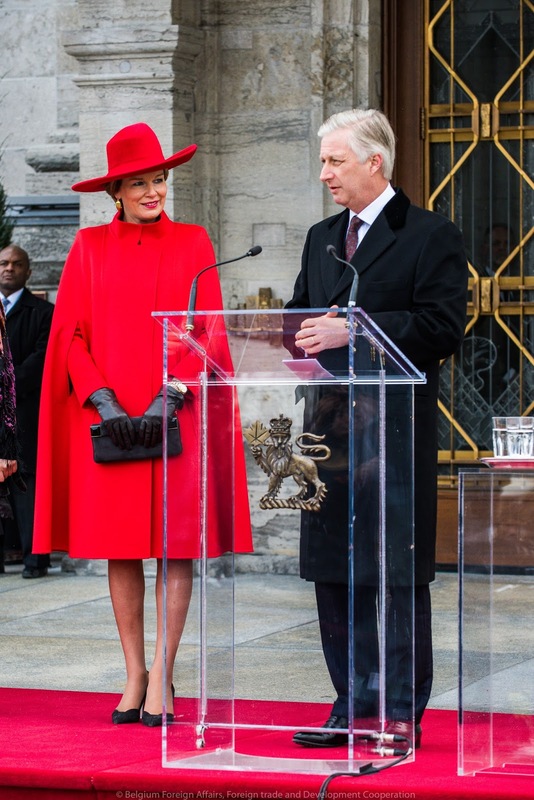 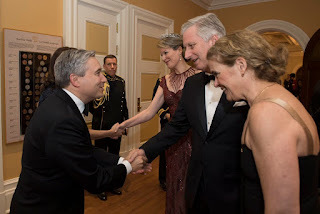 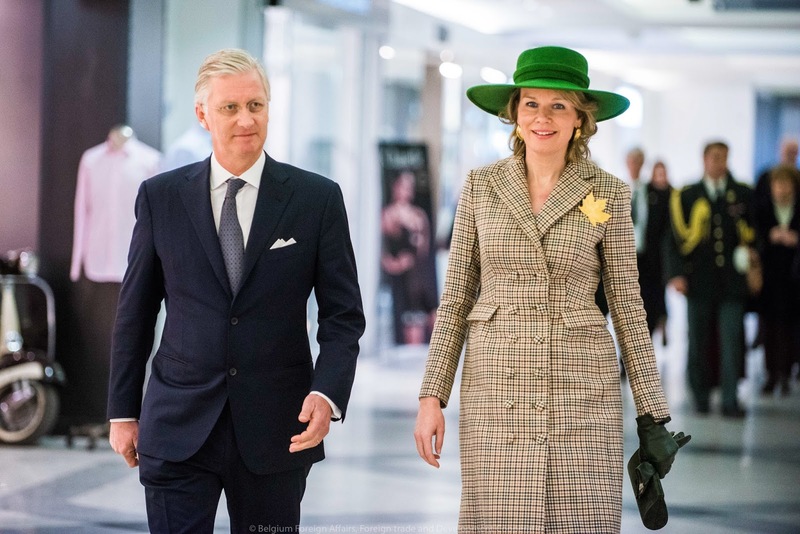 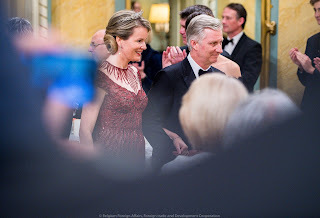 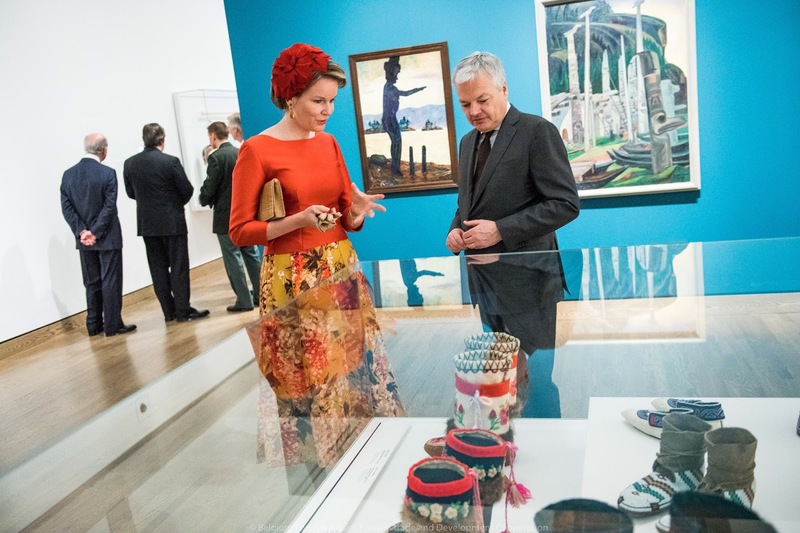 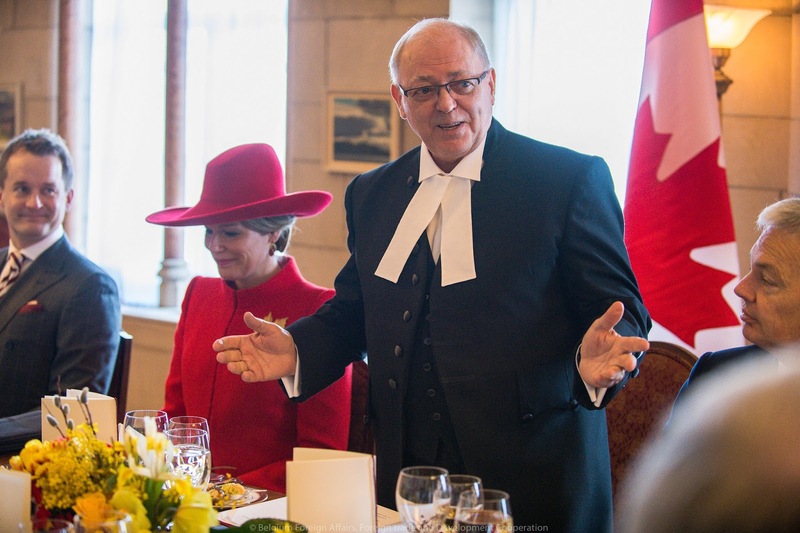 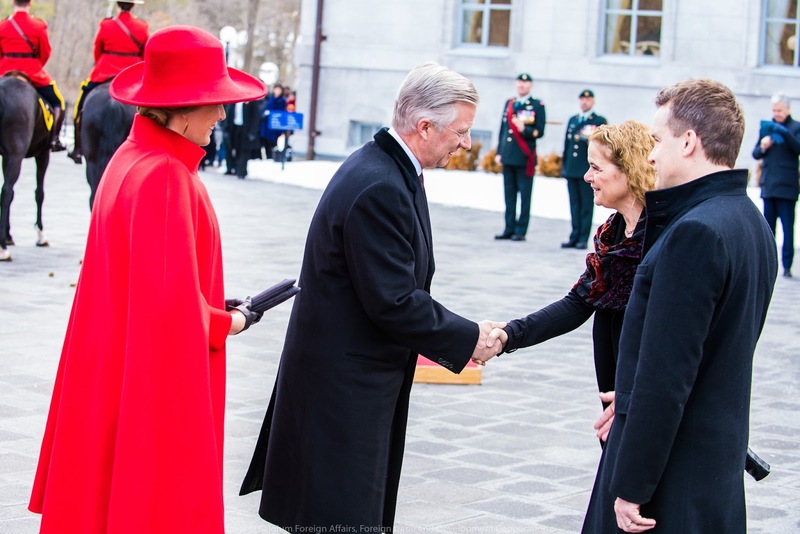 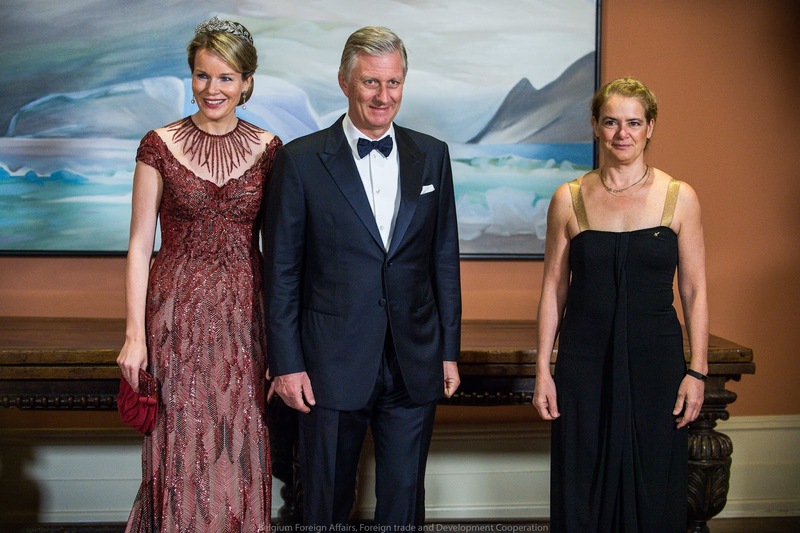 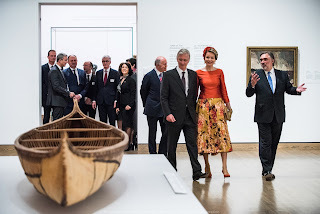 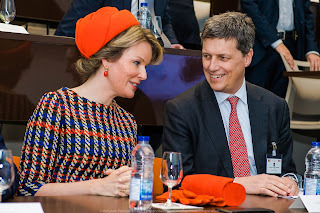 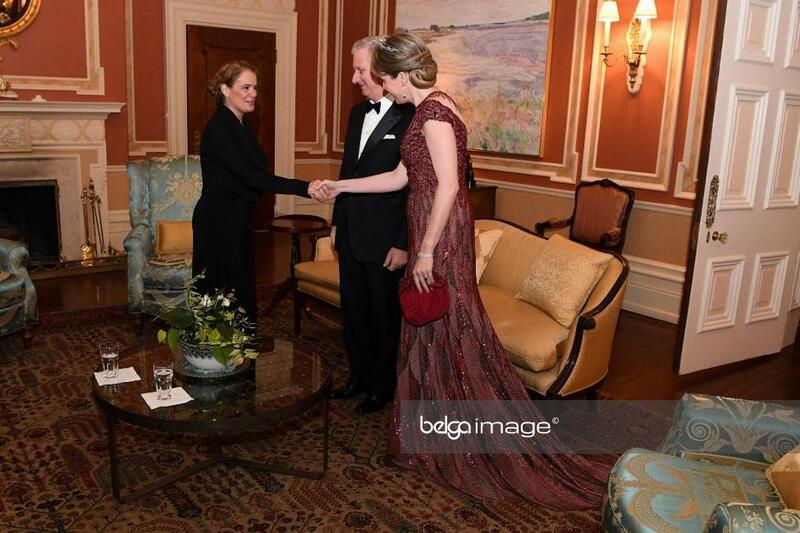 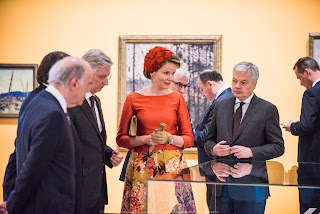 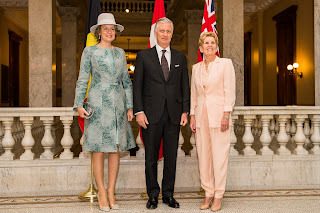 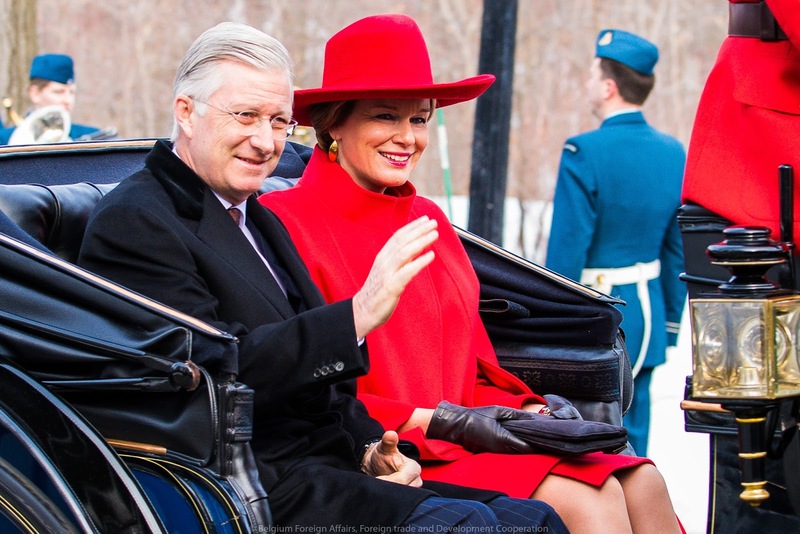 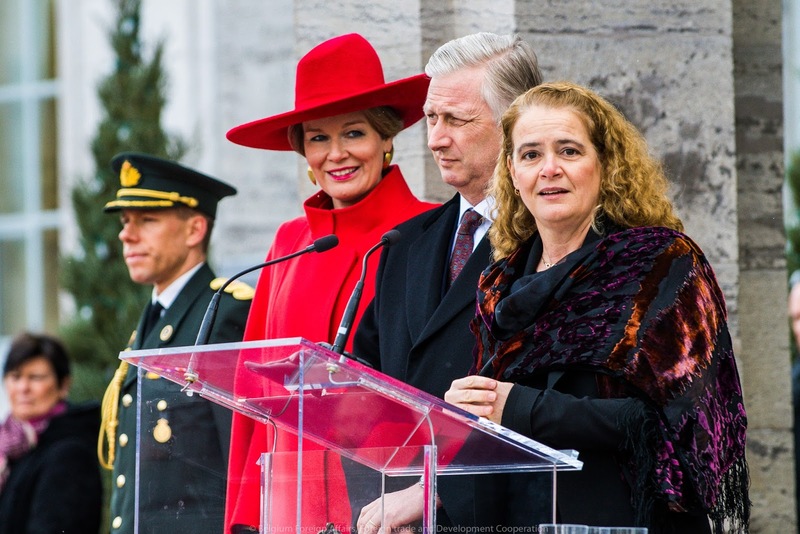 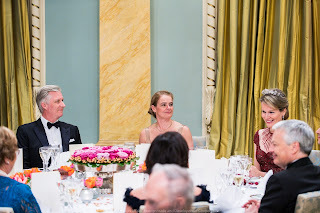 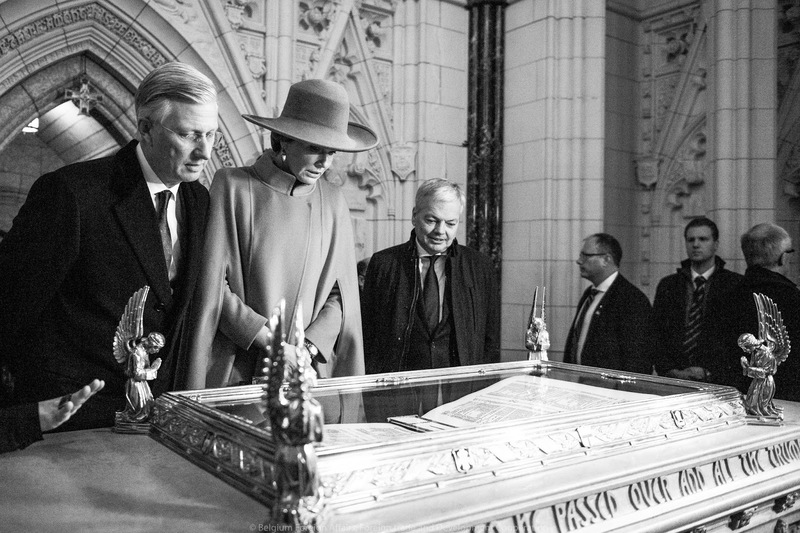 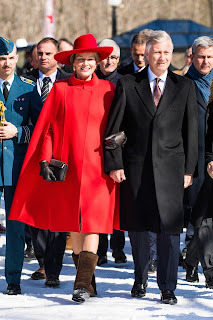 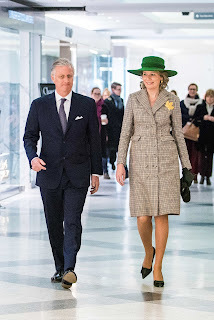 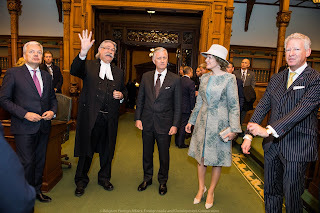 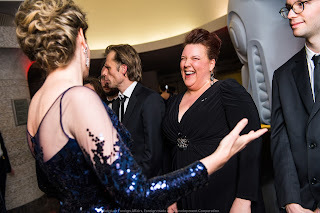 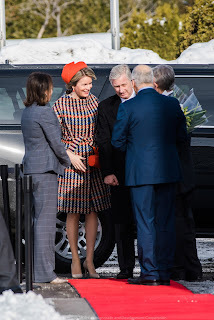 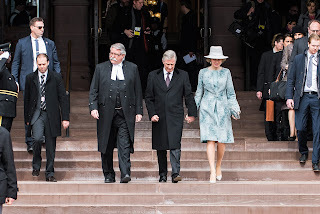 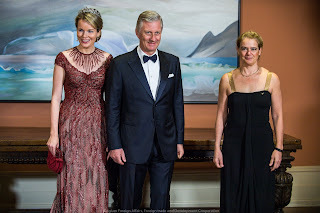 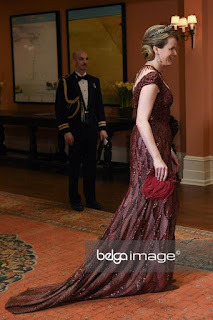 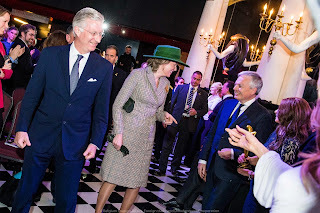 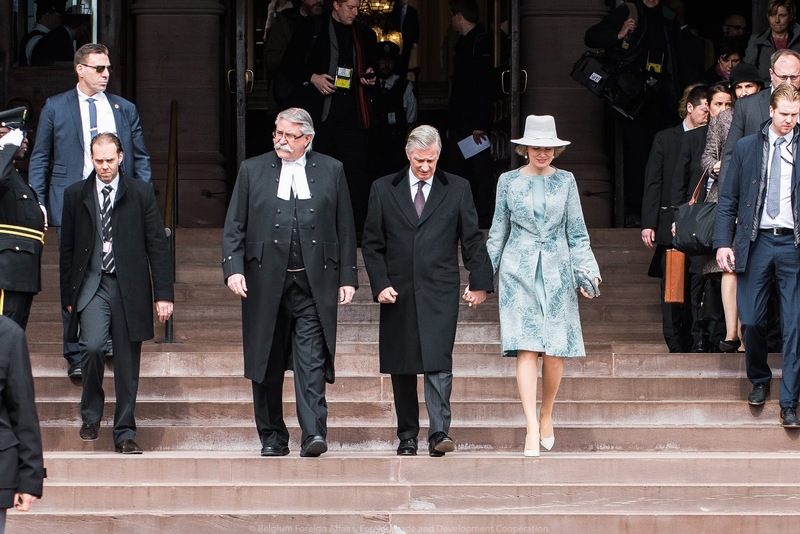 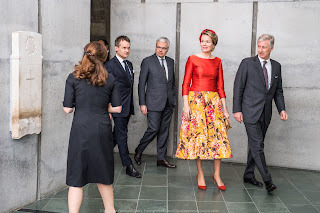 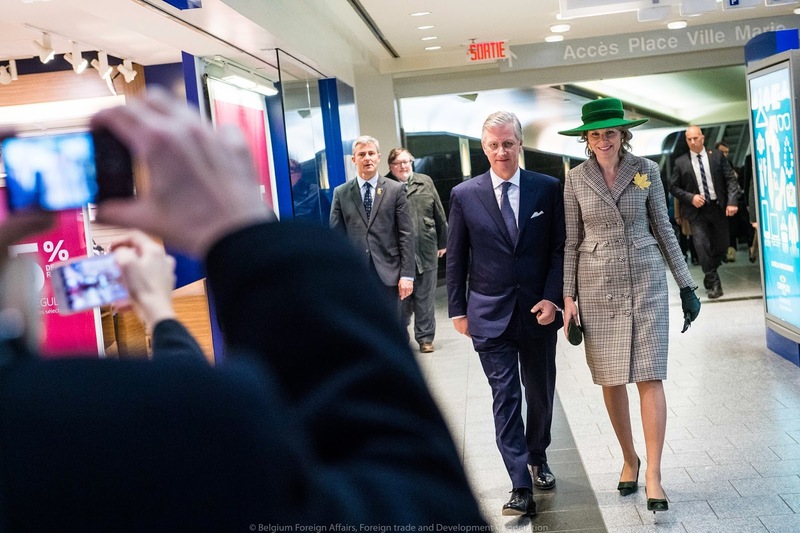 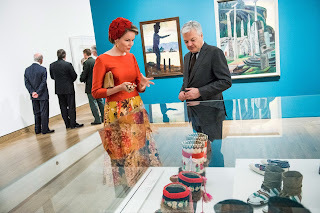 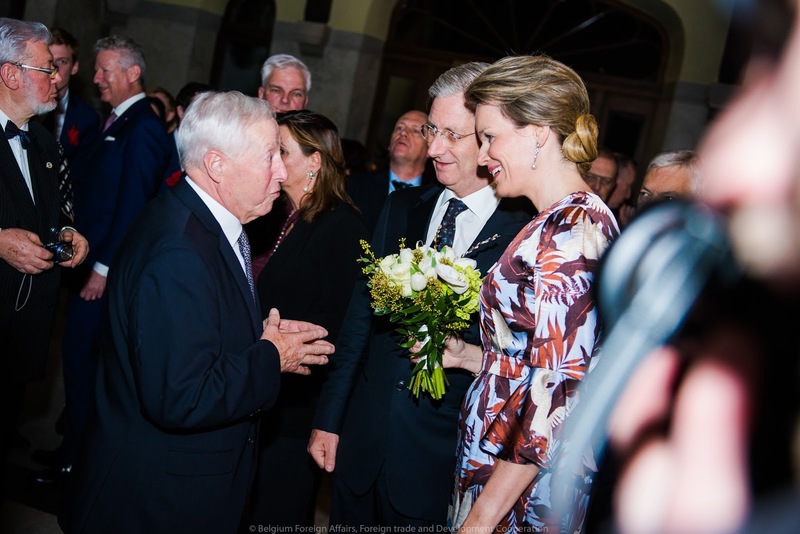 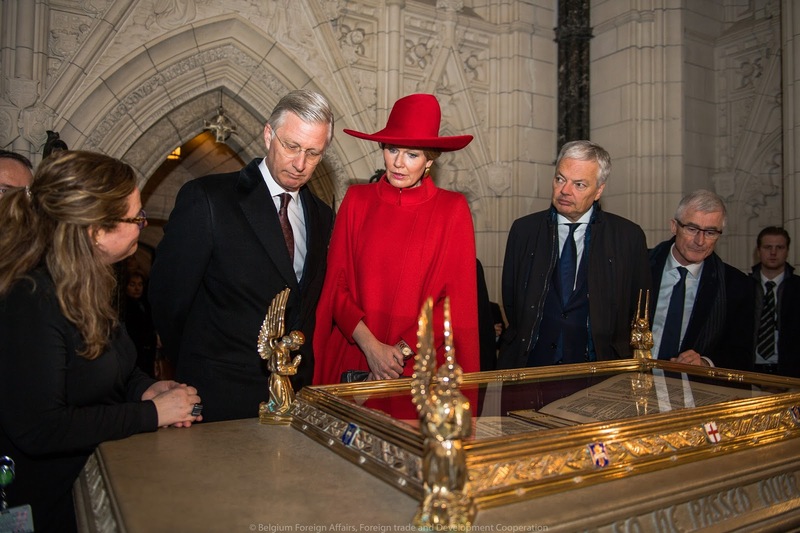 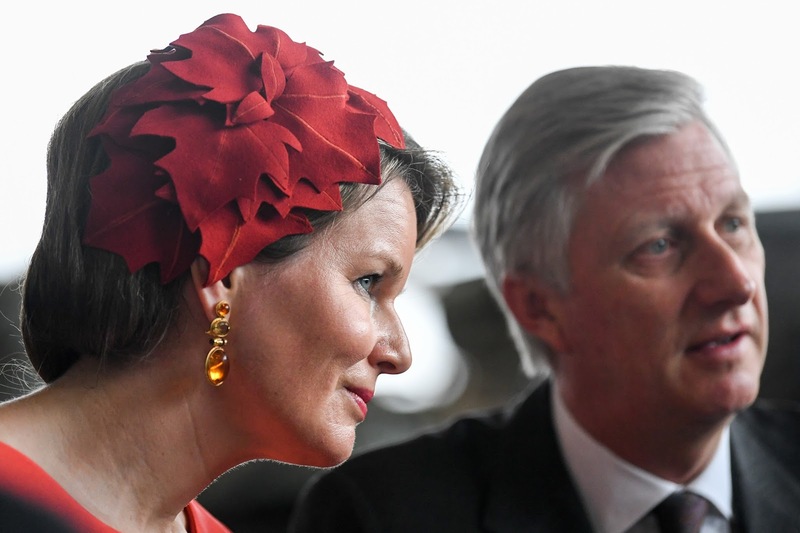 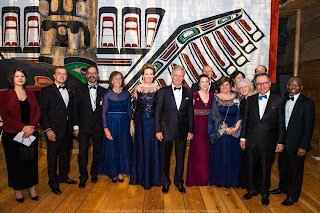 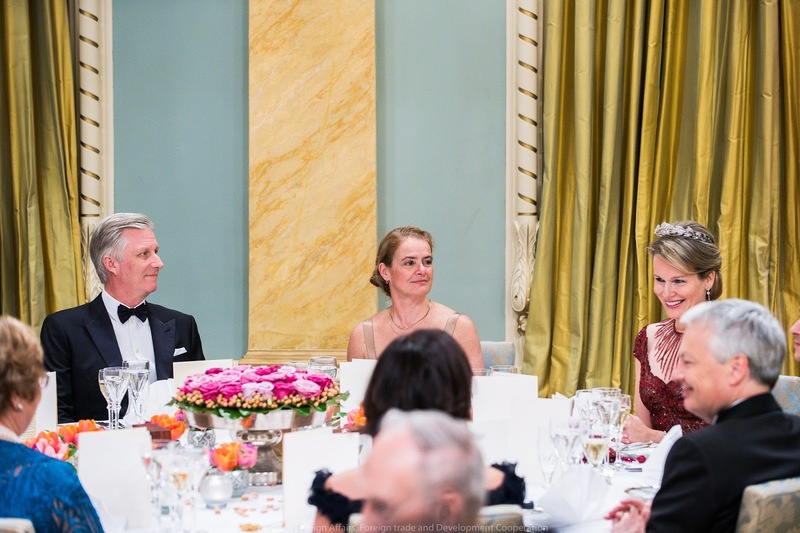 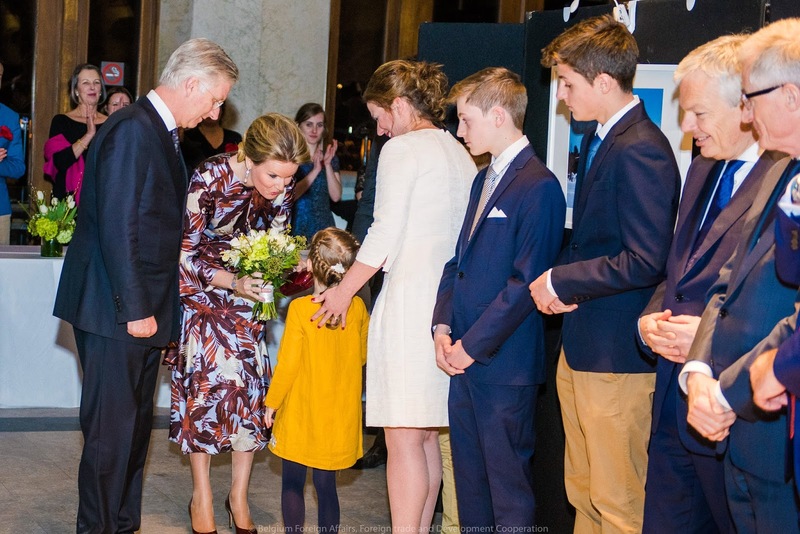 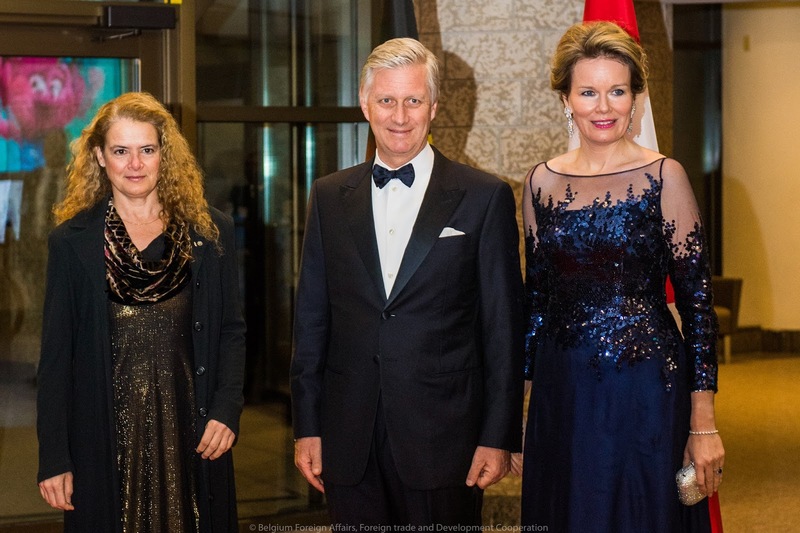 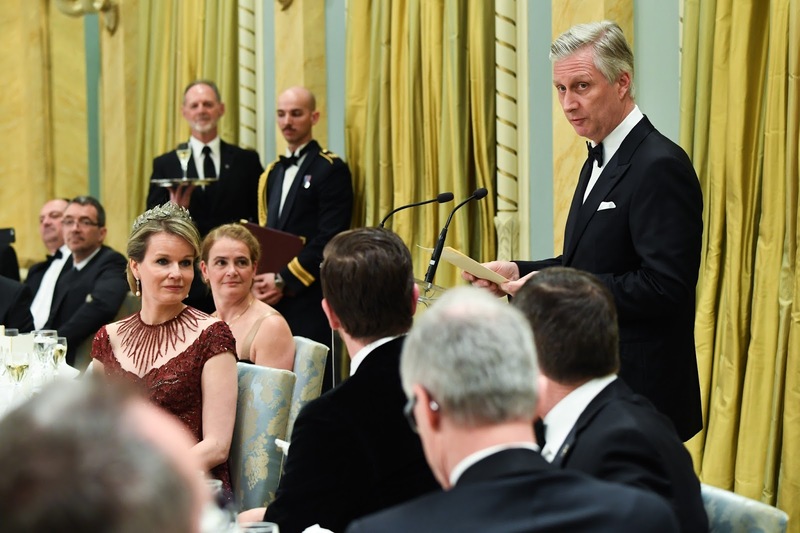 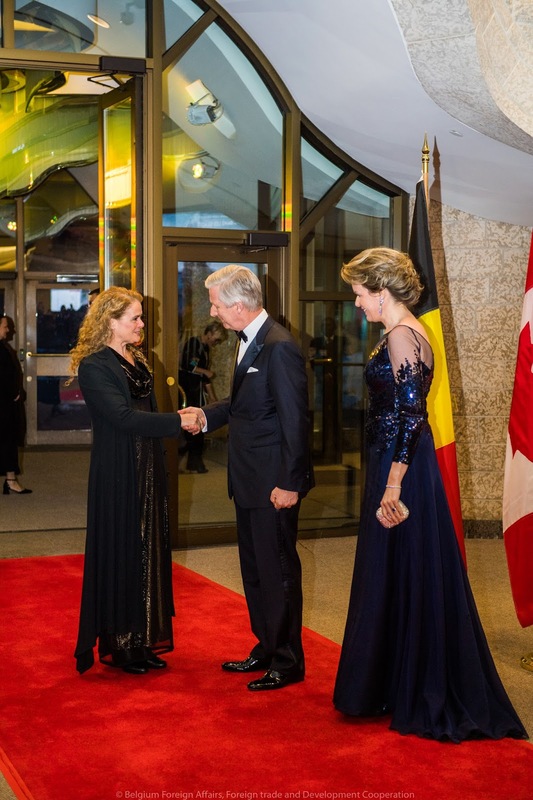 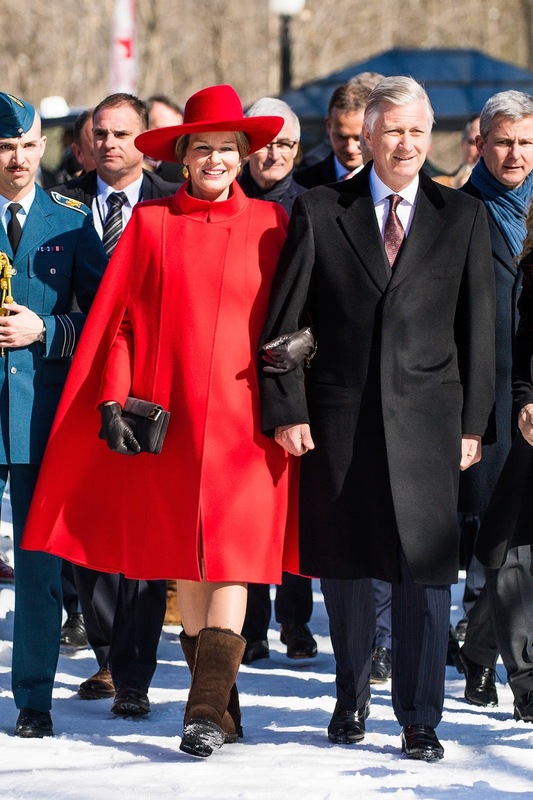 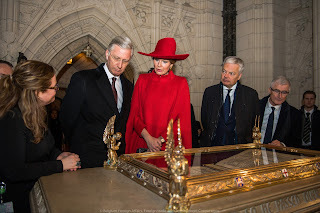 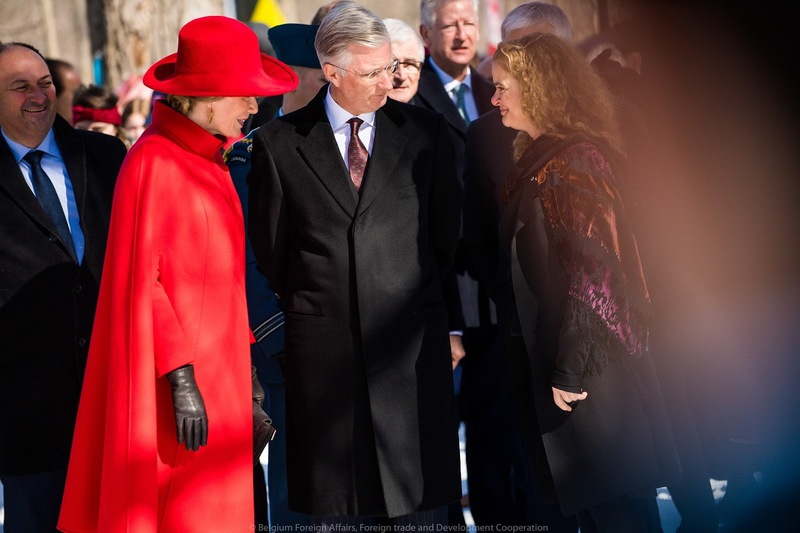 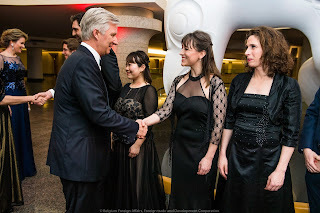 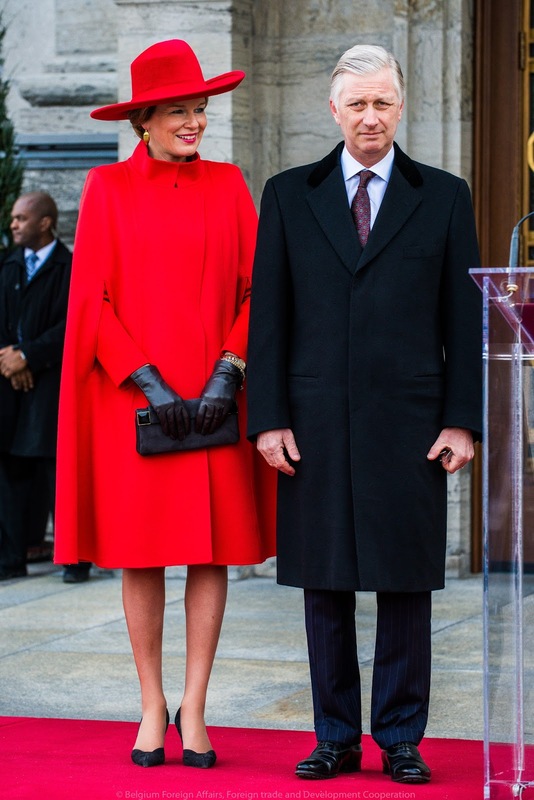 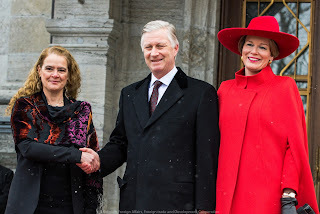 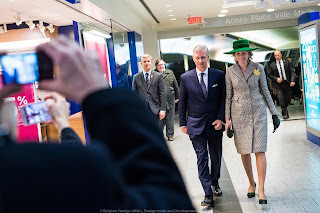 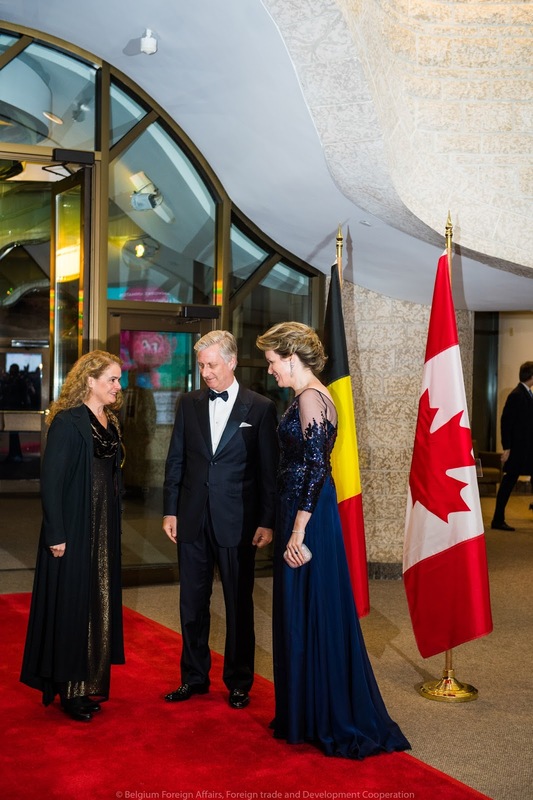 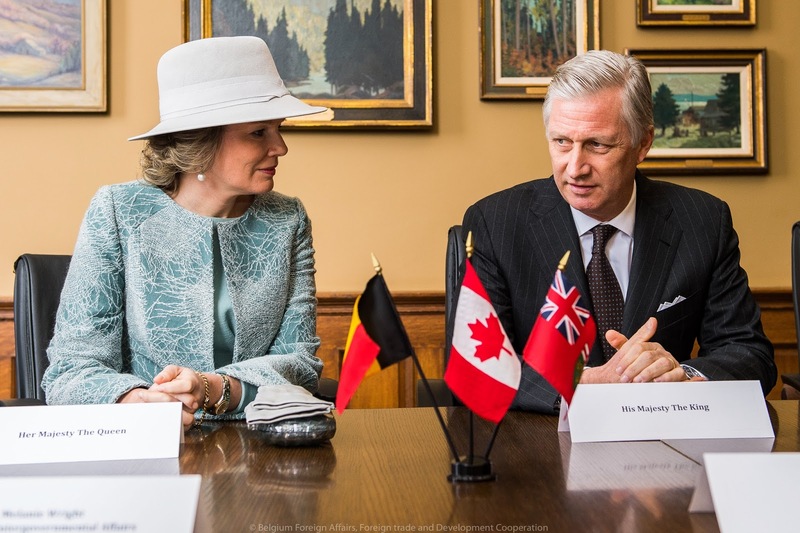 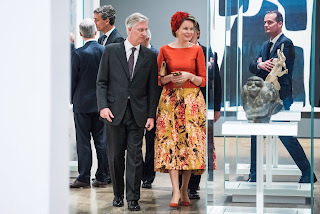 At night, king Philippe & queen Mathilde hosted a walking dinner in honour of governor-general Payette at the Museum of History. The guests were treated to Filip Jordens' "Hommage à Brel". 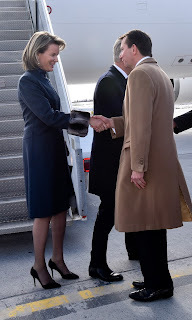 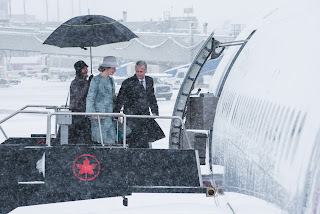 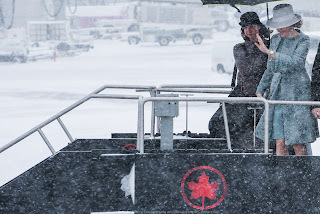 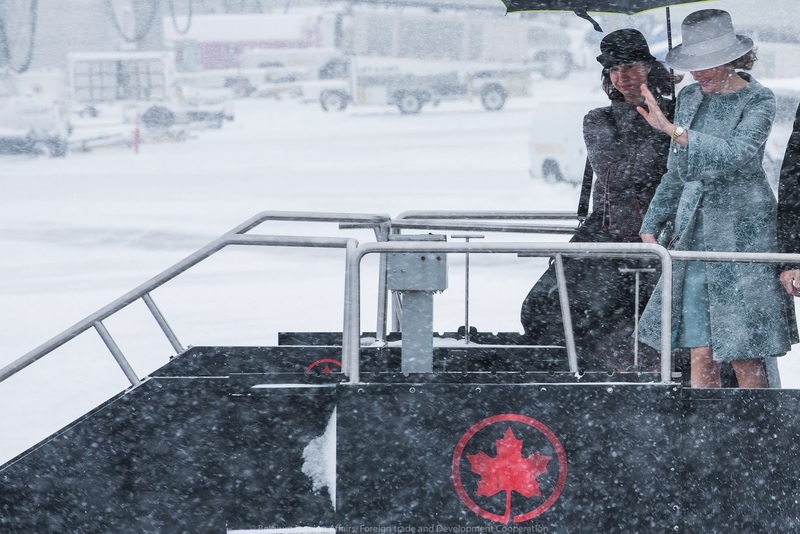 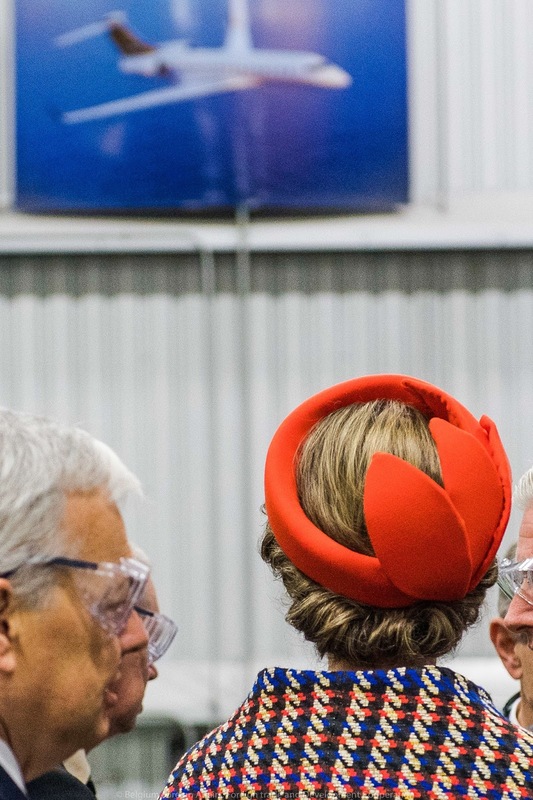 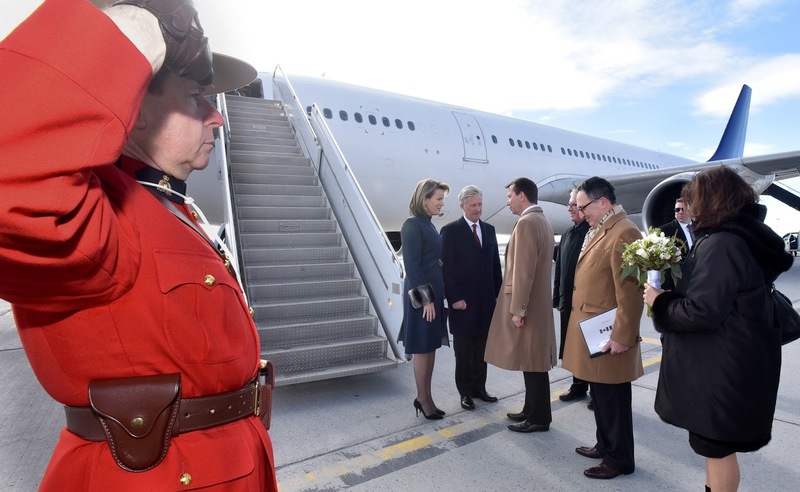 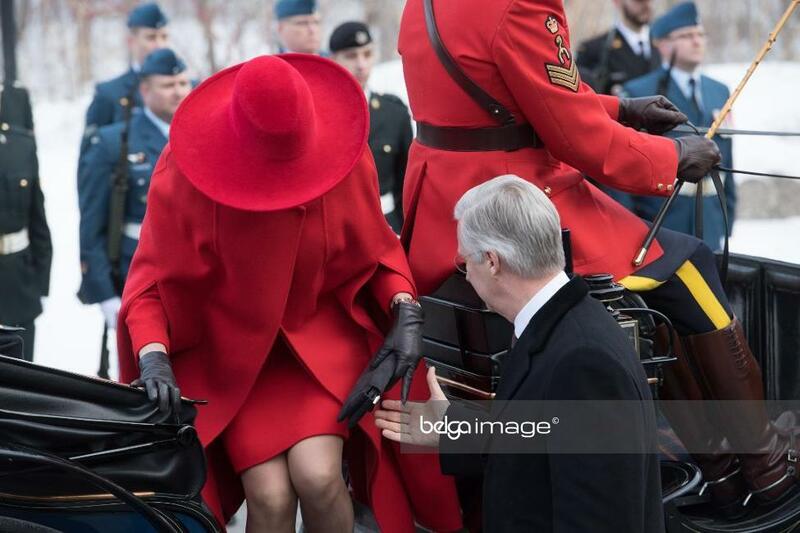 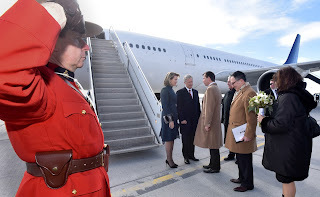 In the morning, the royal couple and their delegation left Ottawa for Toronto, a 1 hour flight. 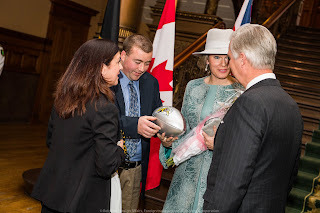 They were received by Elizabeth Dowdeswell, Lieutenant Governor of Ontario and welcomed to the Ontario Legislative Building. 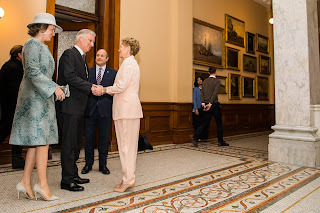 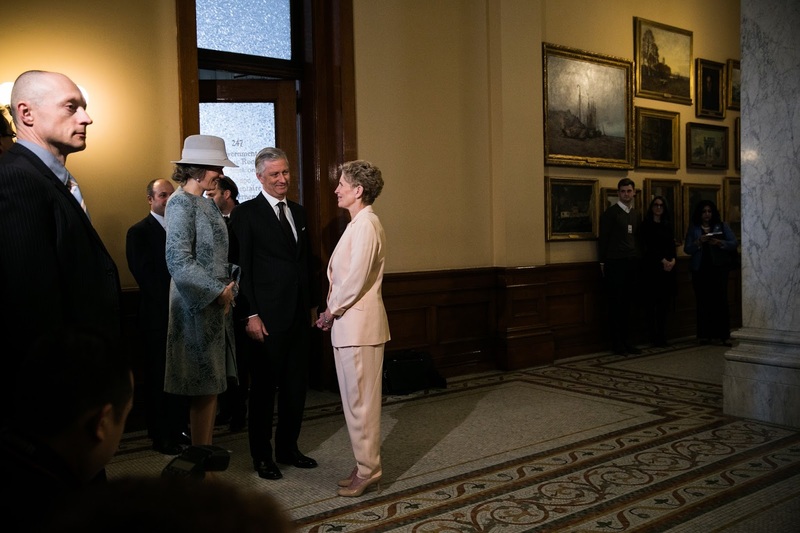 With Ontario's premier, Mrs Wynne. An official luncheon was hosted by Reza Moridi, Minister of Research, Science & Innovation. 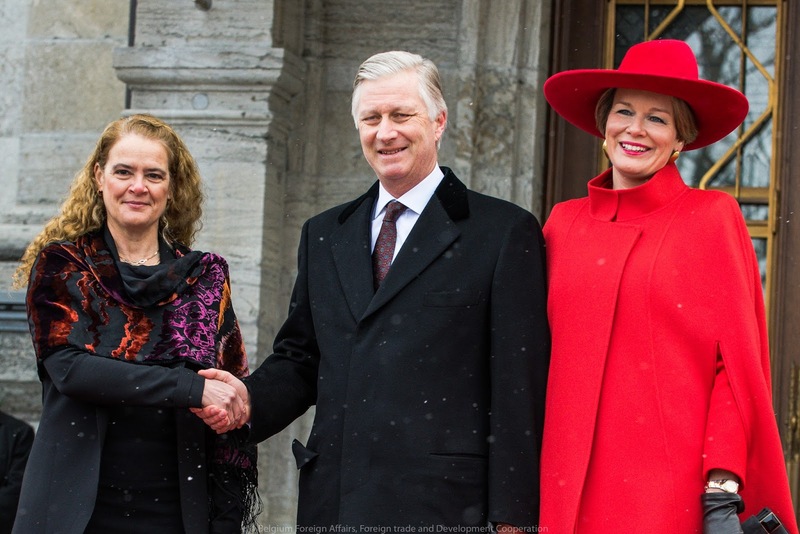 The king & queen particicpated in the group photo following the signing ceremony. 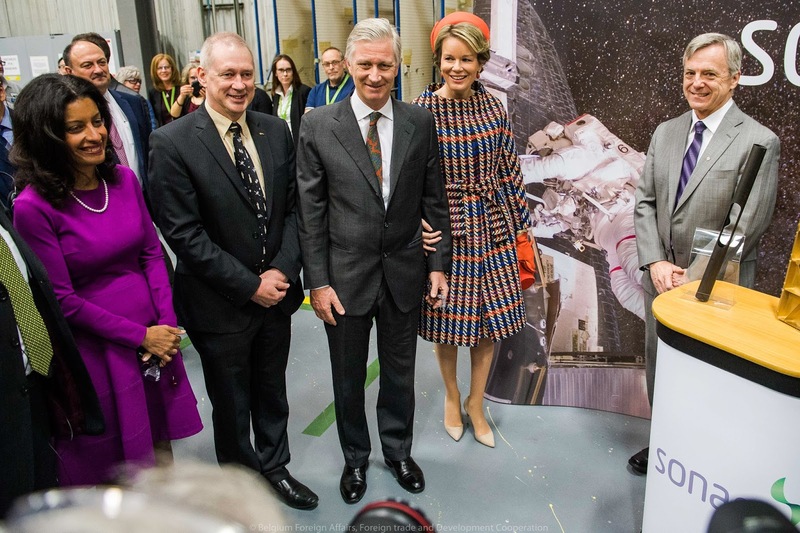 At 14:15 the king & queen were given a Tour of the MaRS Venture Showcase. 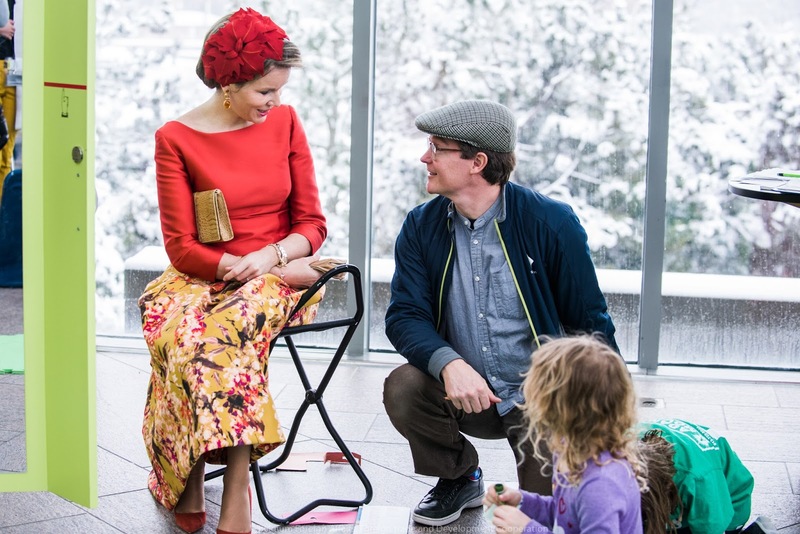 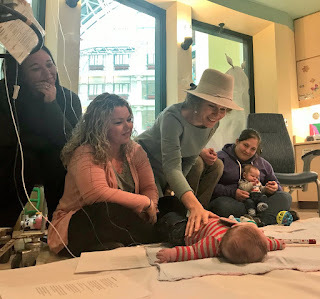 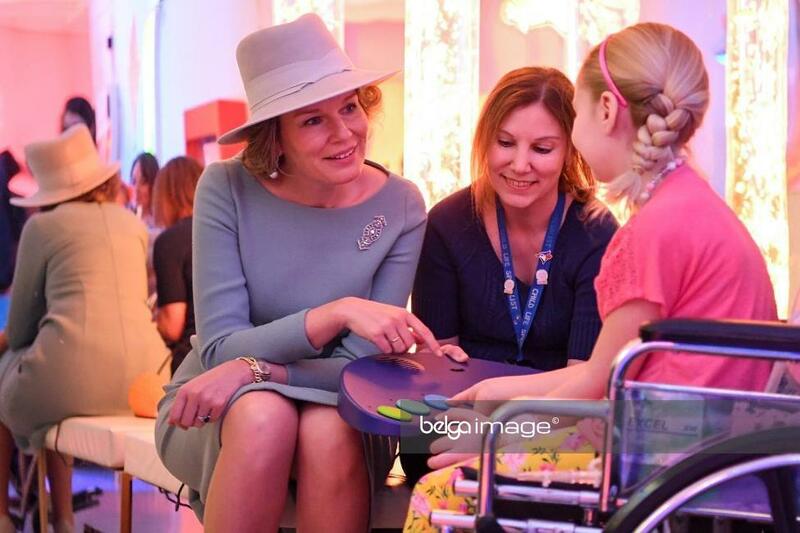 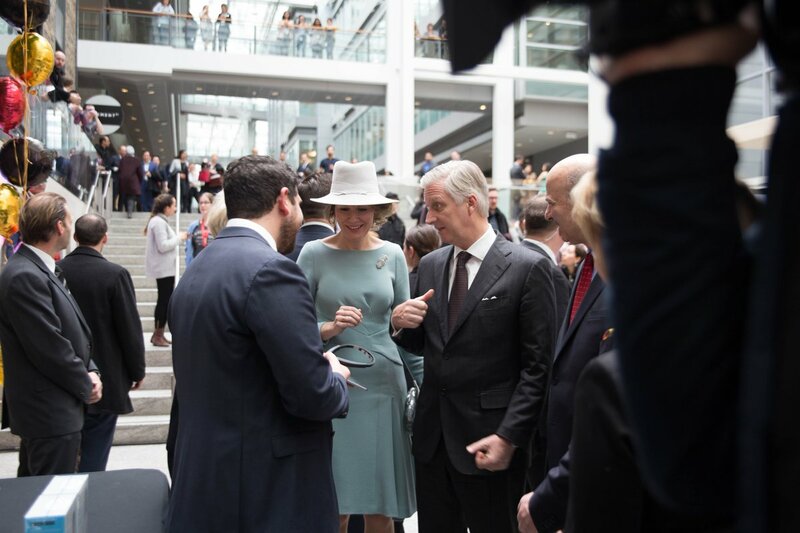 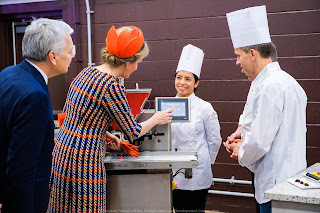 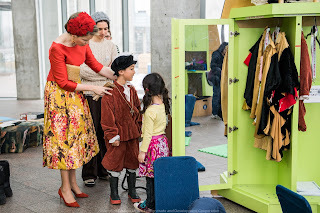 Afterwards, queen Mathilde visited SickKids Hospital where she took part in a roundtable discussion. 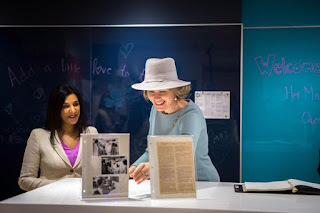 Looking at a picture of queen Fabiola, who visited the hospital 40 years ago. 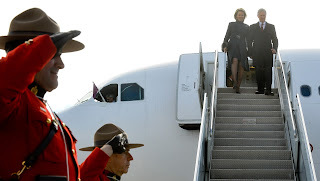 In the evening, they leave Toronto for Montréal, a 1:10 hour flight. 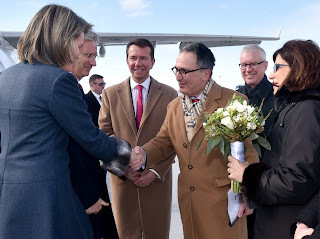 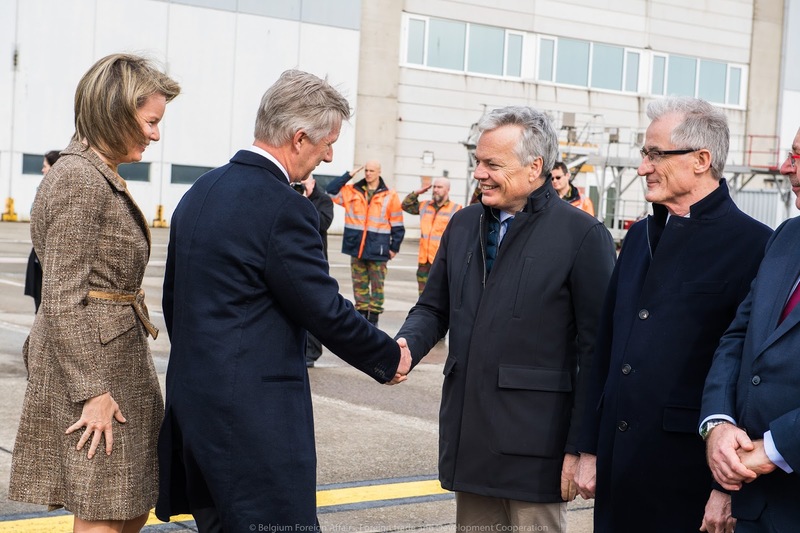 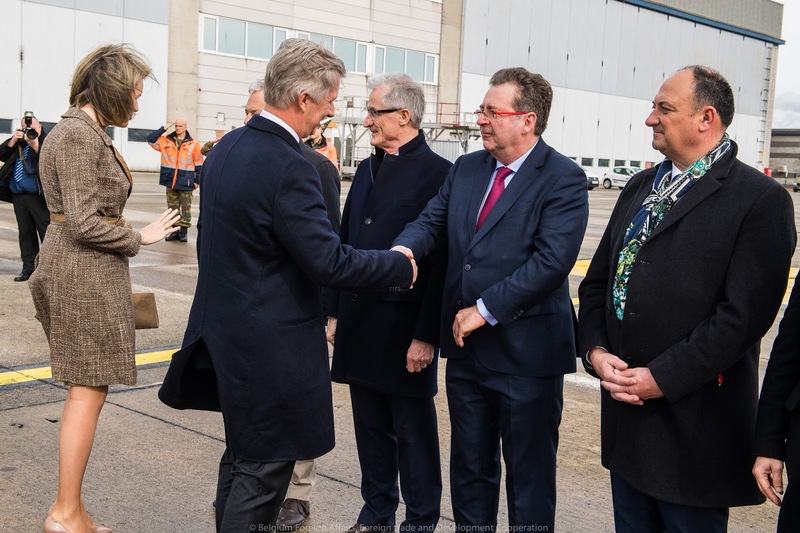 At 9:15 Philippe & Mathilde were joined by Julie Payette & Frank Dewinne for a visit to the Sonaca plant, a Canada-Belgium partnership in the air & space industry. 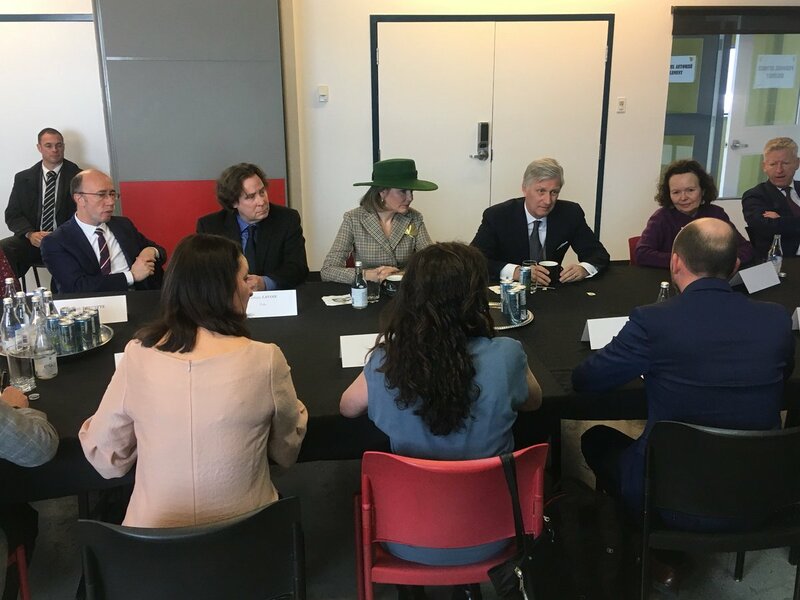 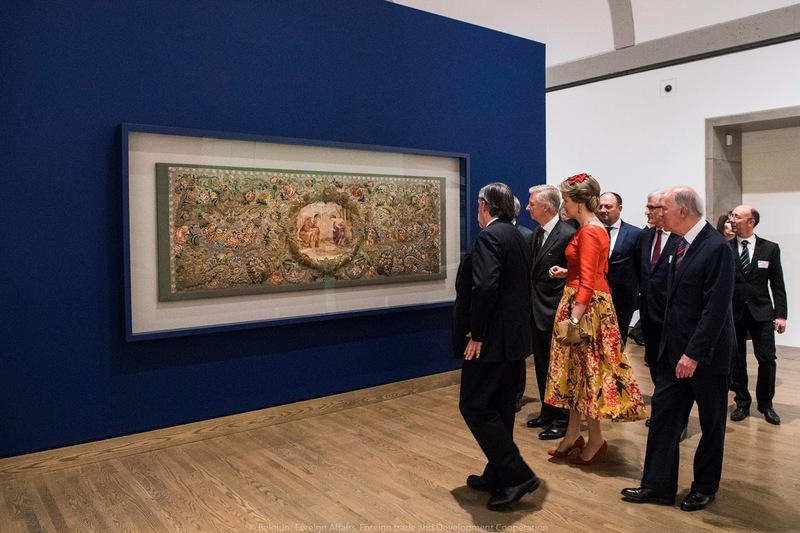 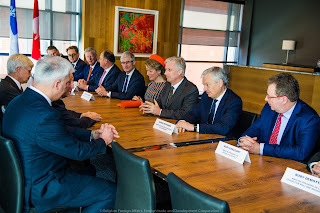 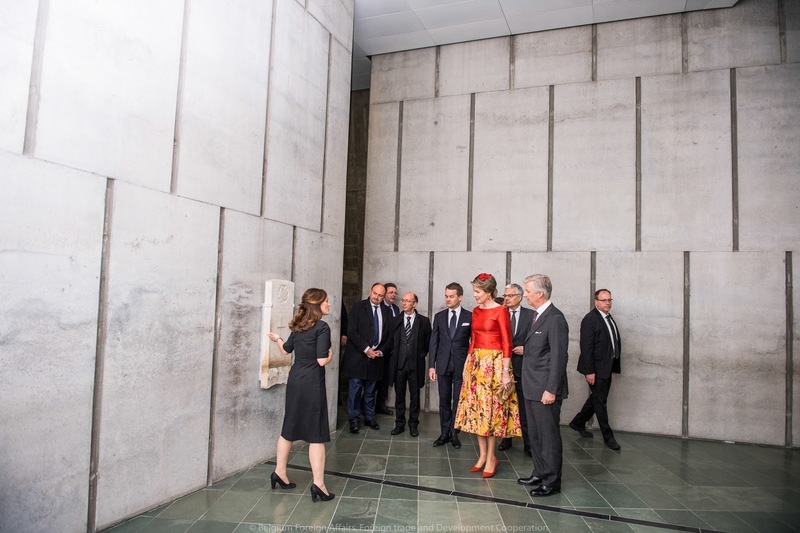 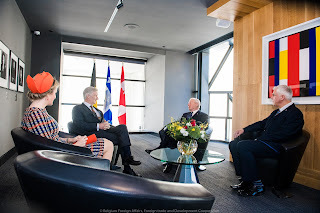 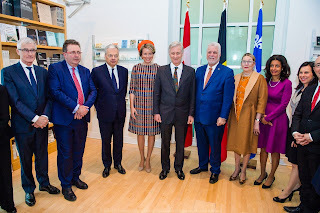 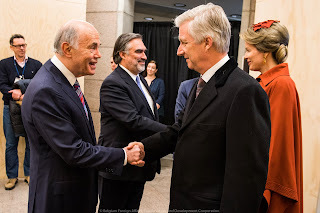 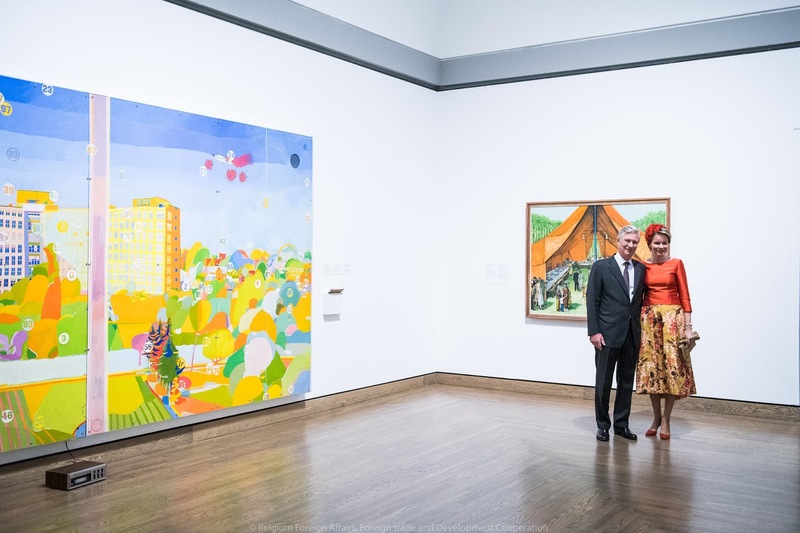 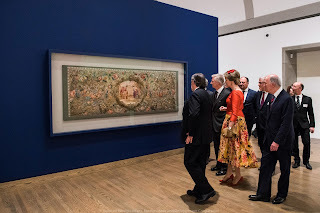 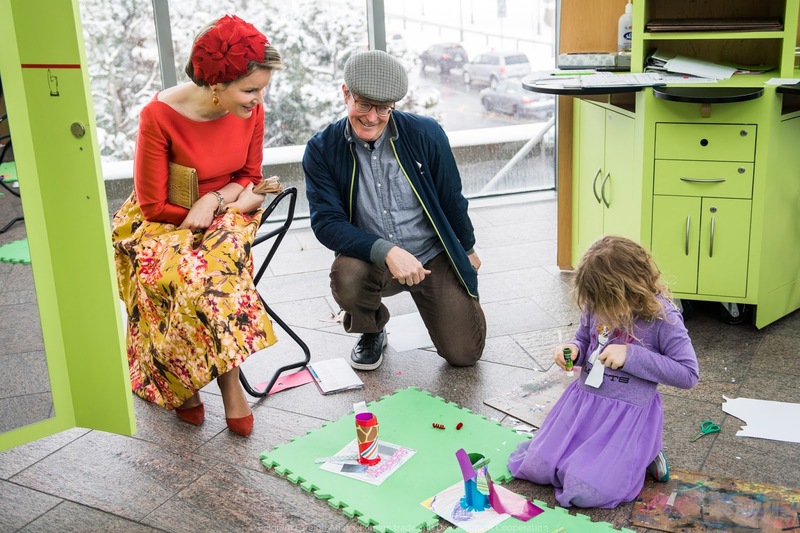 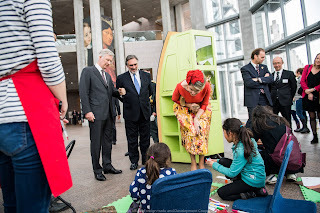 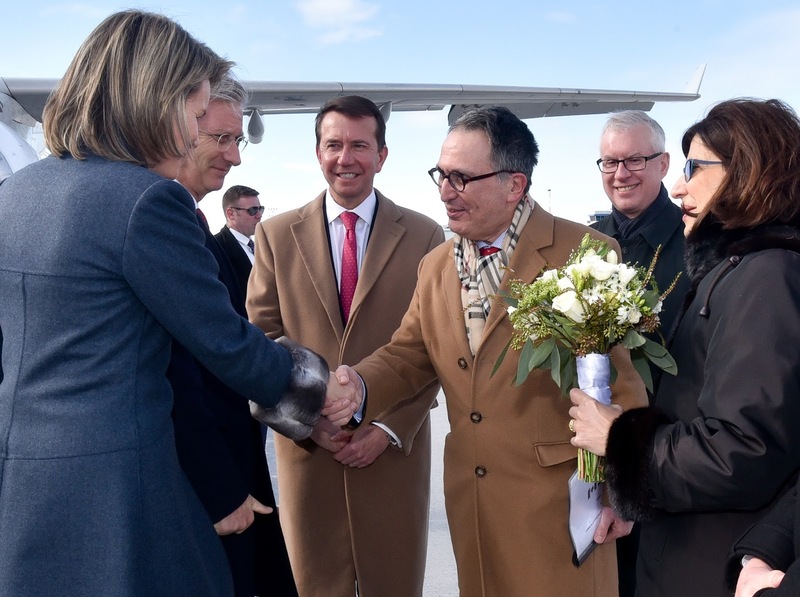 At noon, there were meetings with Québec's lieutenant governor, J. Michel Doyon and Premier Philippe Couillard at the museum of fine arts of Montréal. 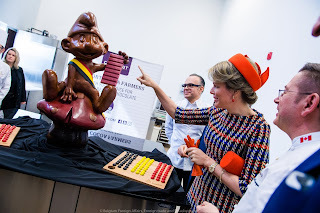 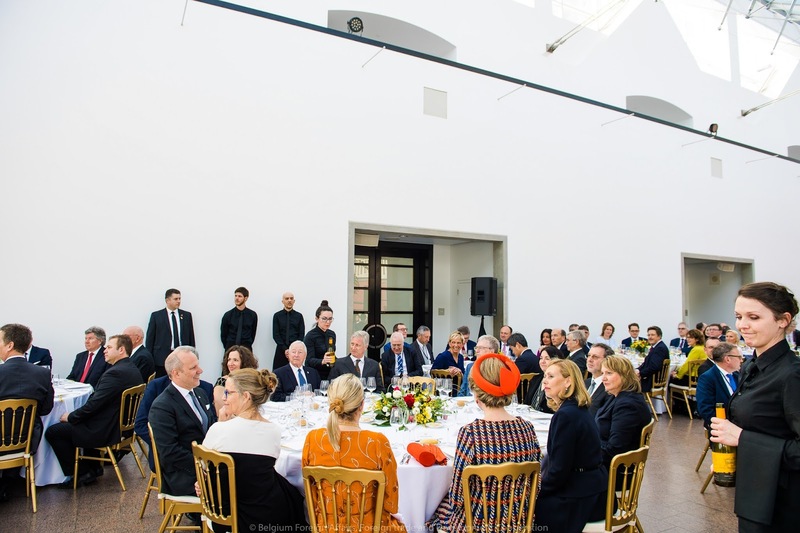 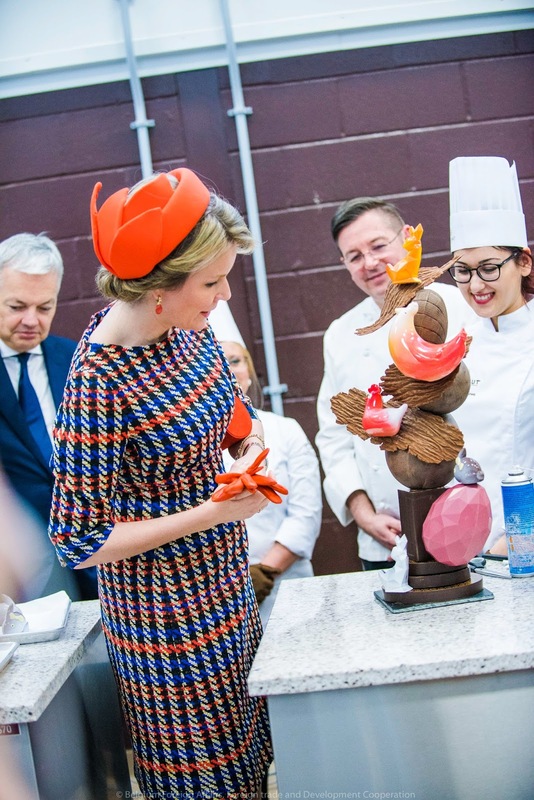 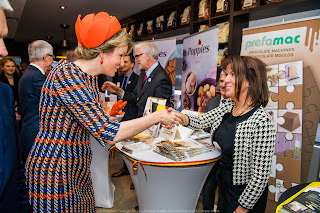 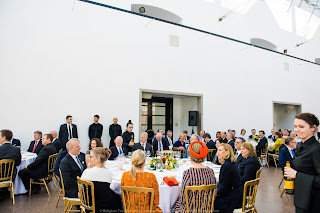 In the afternoon, the queen attended a Belgian Food and Gastronomy Event. 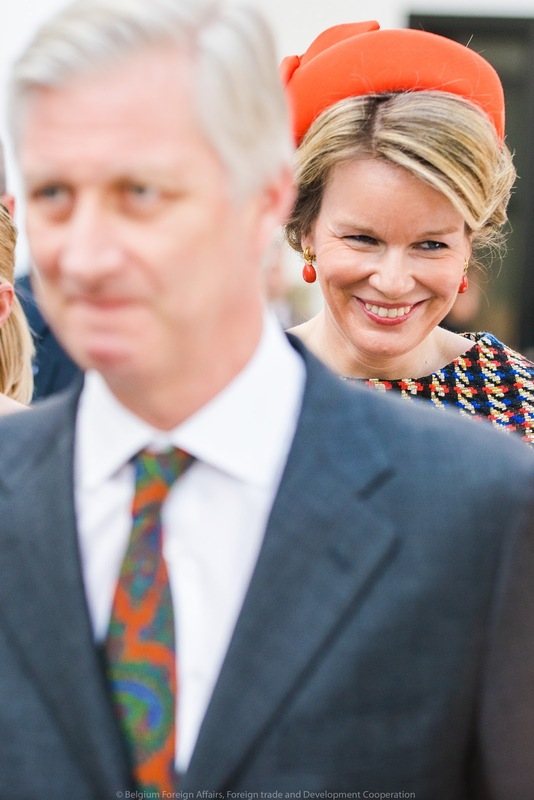 Claire Tillekaerts (ceo at Flanders Investment & Trade, and personal friend) in the background. 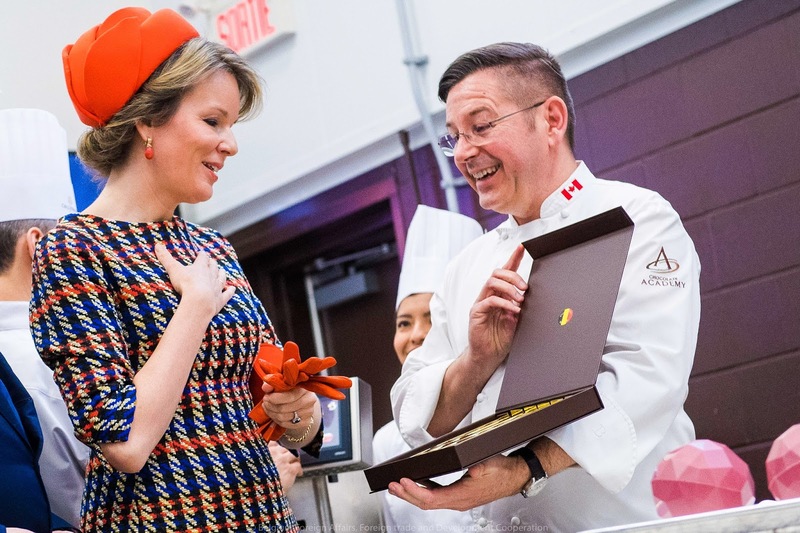 With Antoine de Saint-Affrique, CEO of Barry Callebaut. 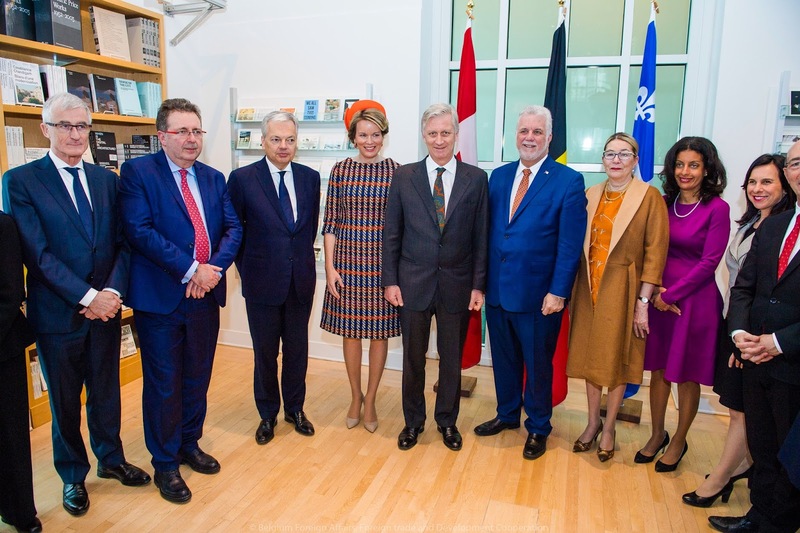 A conference on artificial Intelligence in presence of Mr Couillard. 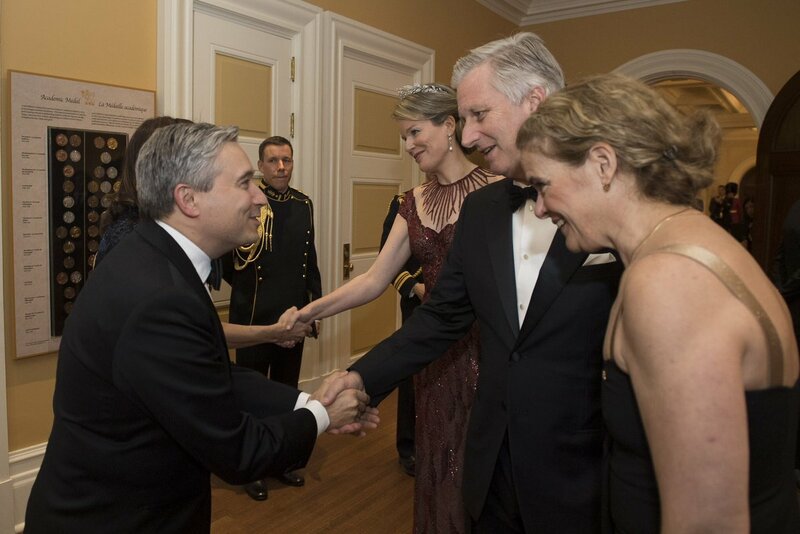 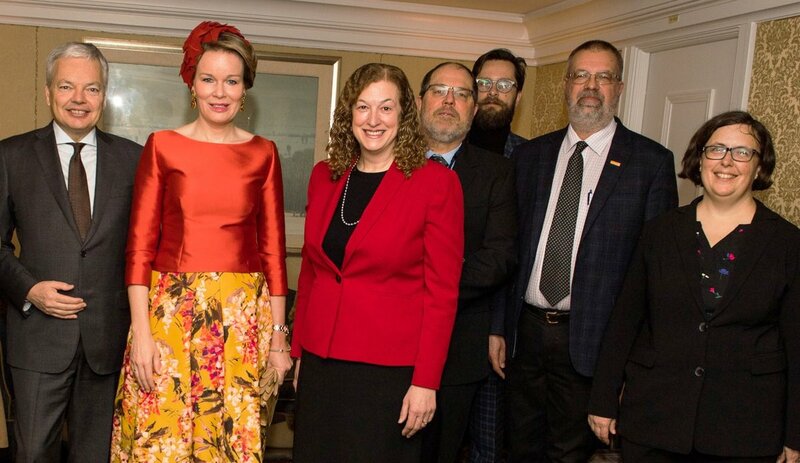 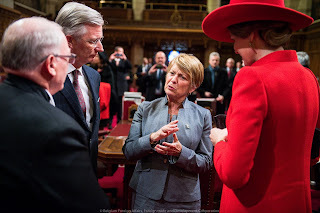 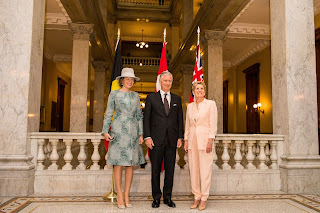 At 19:00 the lieutenant governor of Québec joined Philippe & Mathilde at a reception for the Belgian community living in Québec. Mathilde wore a dress by Canada born designer Erdem. 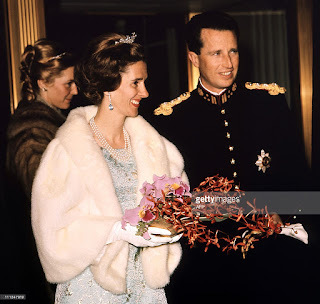 Her fur stole is an inheritance from the late queen Fabiola. Philippe & Mathilde started the day with a roundtable on social entrepreneurship. 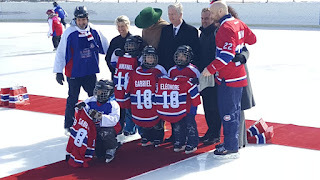 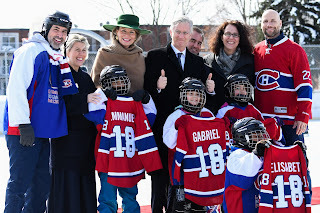 Then they visited a project of the Montreal Canadiens Children’s Foundation. At an introduction to ice hockey they were given T shirts for their children. 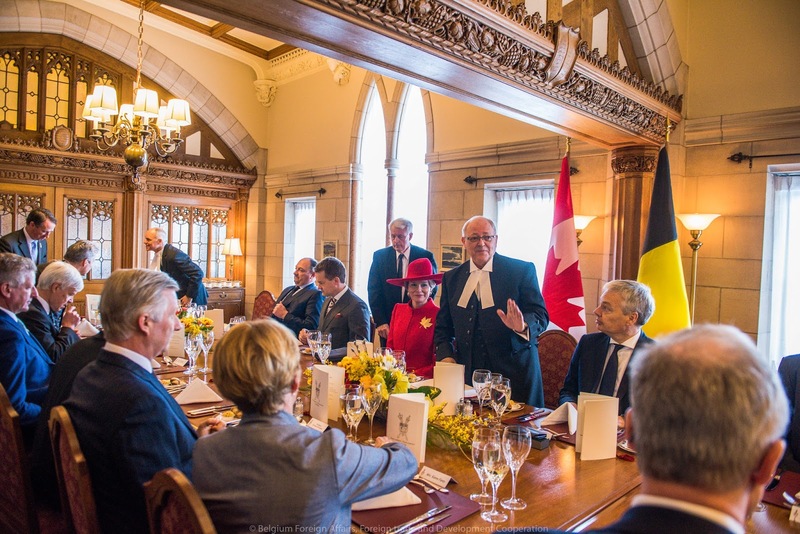 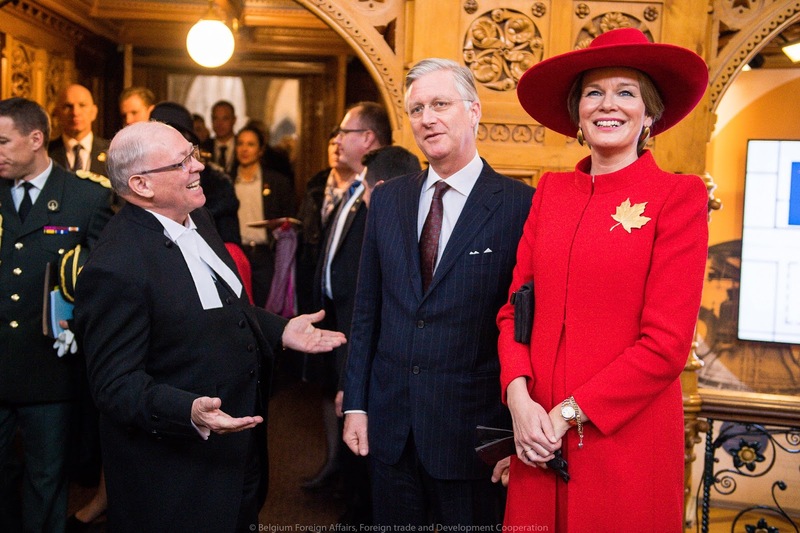 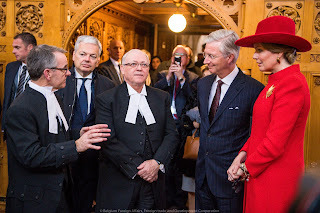 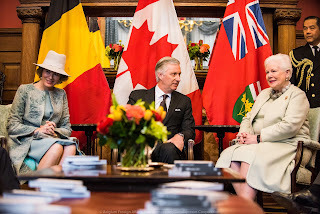 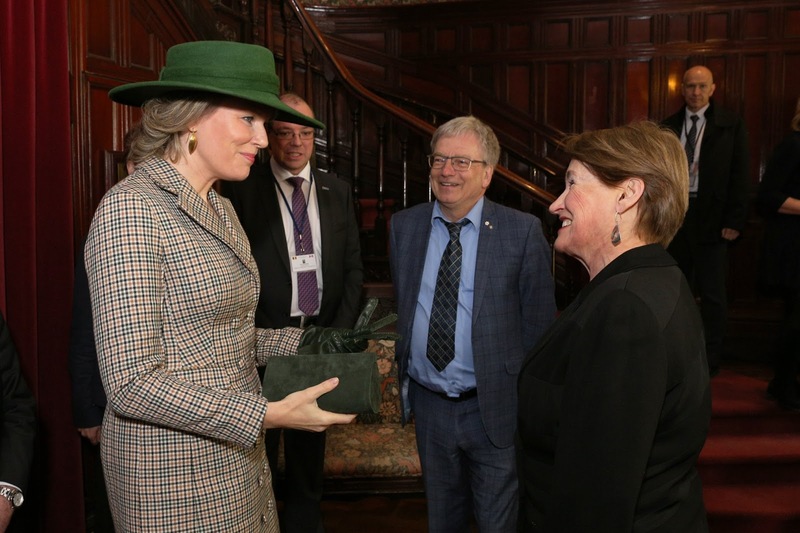 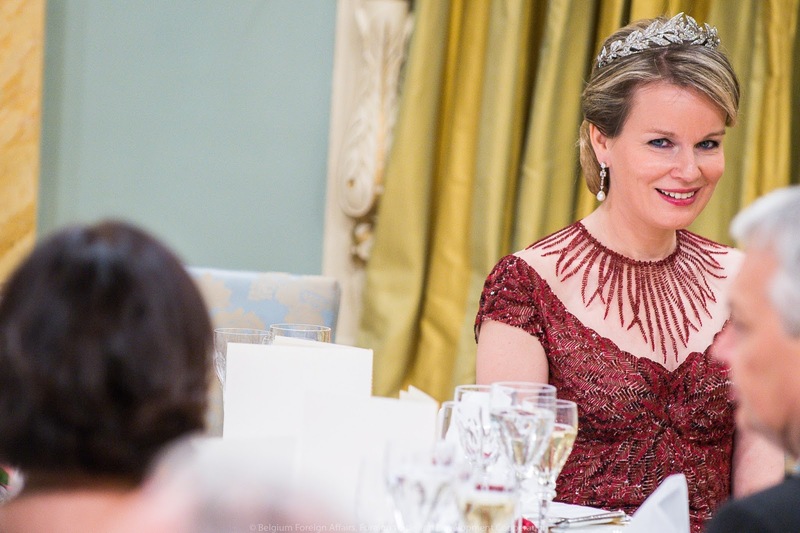 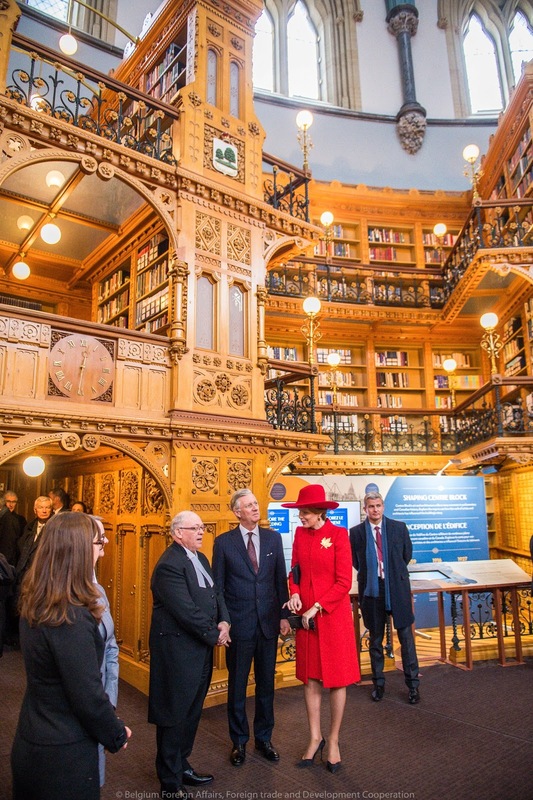 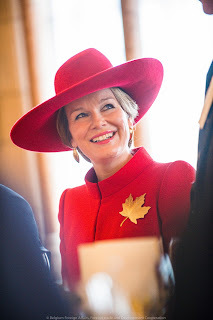 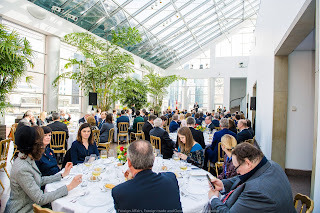 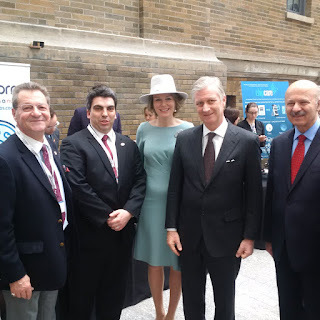 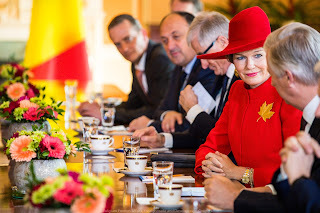 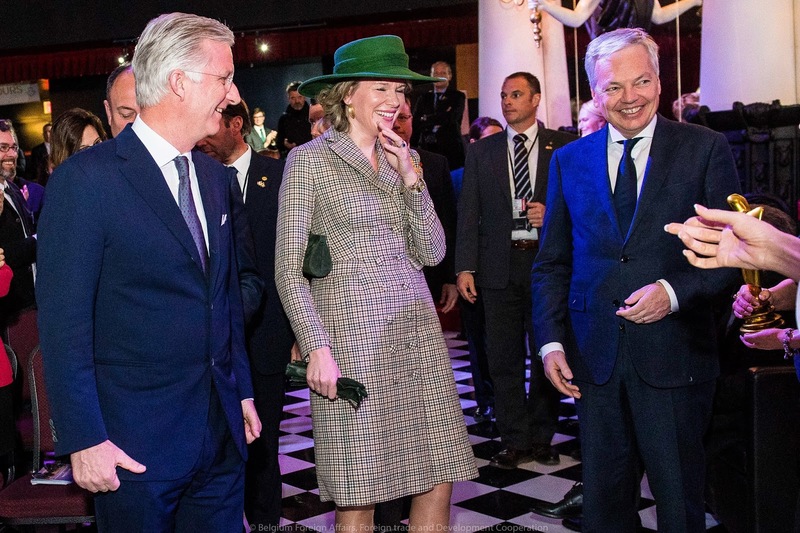 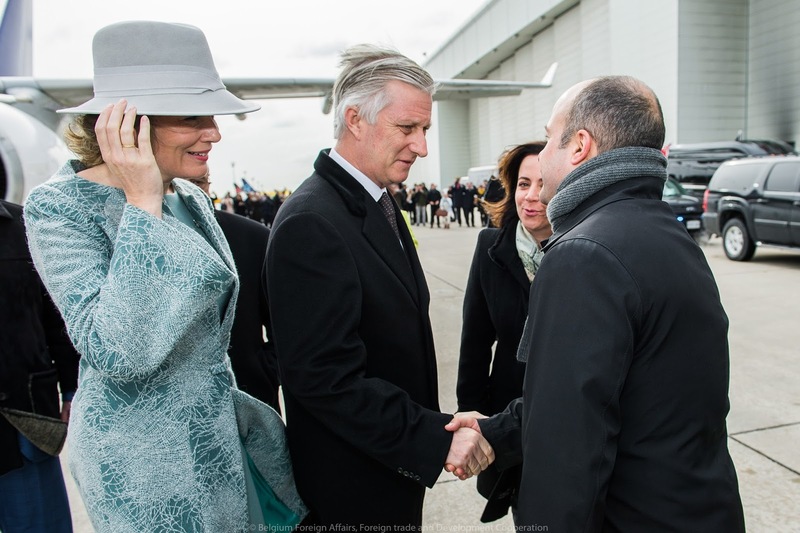 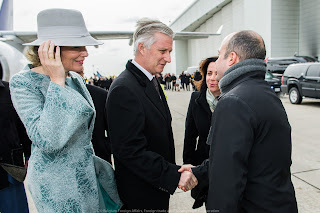 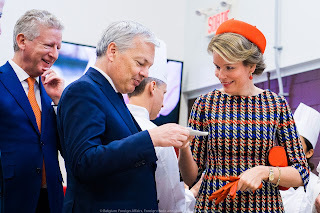 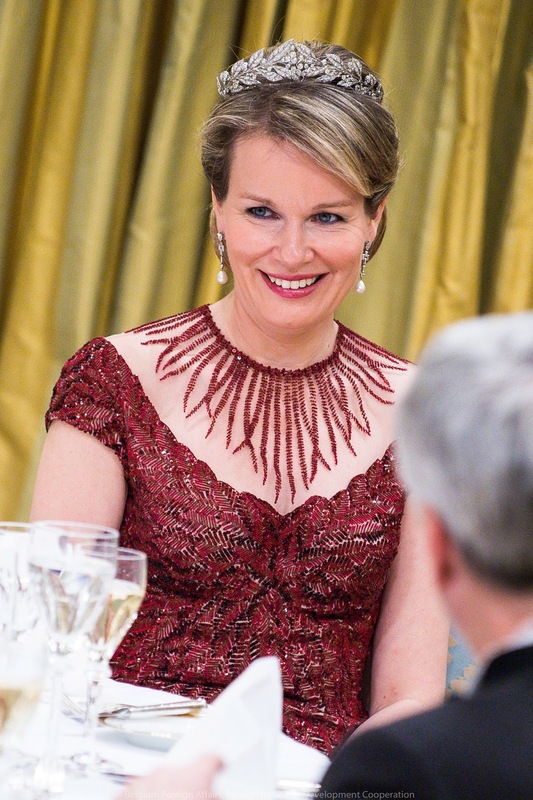 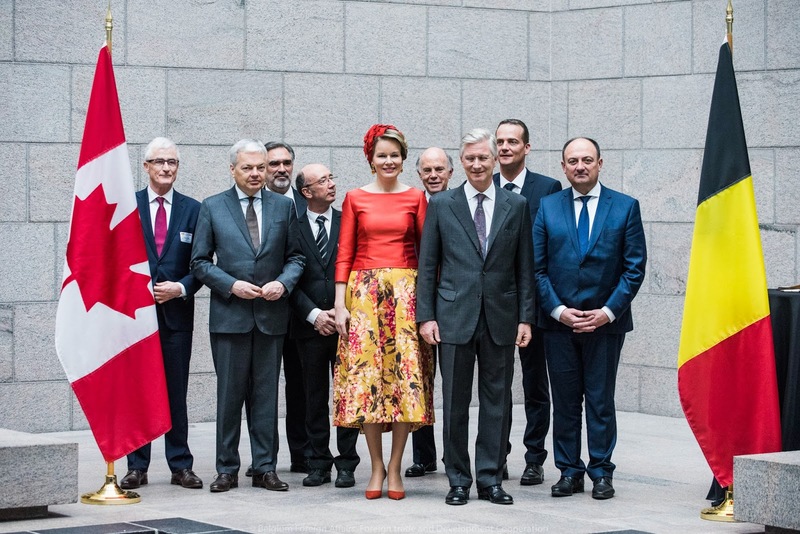 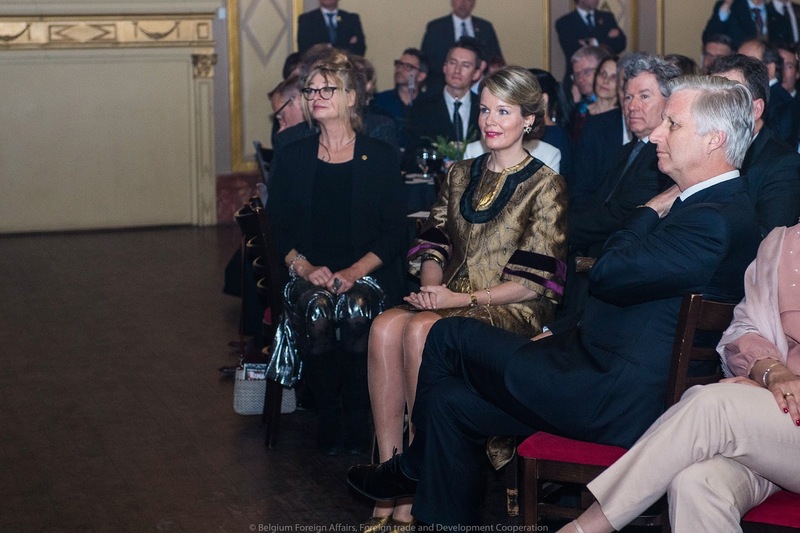 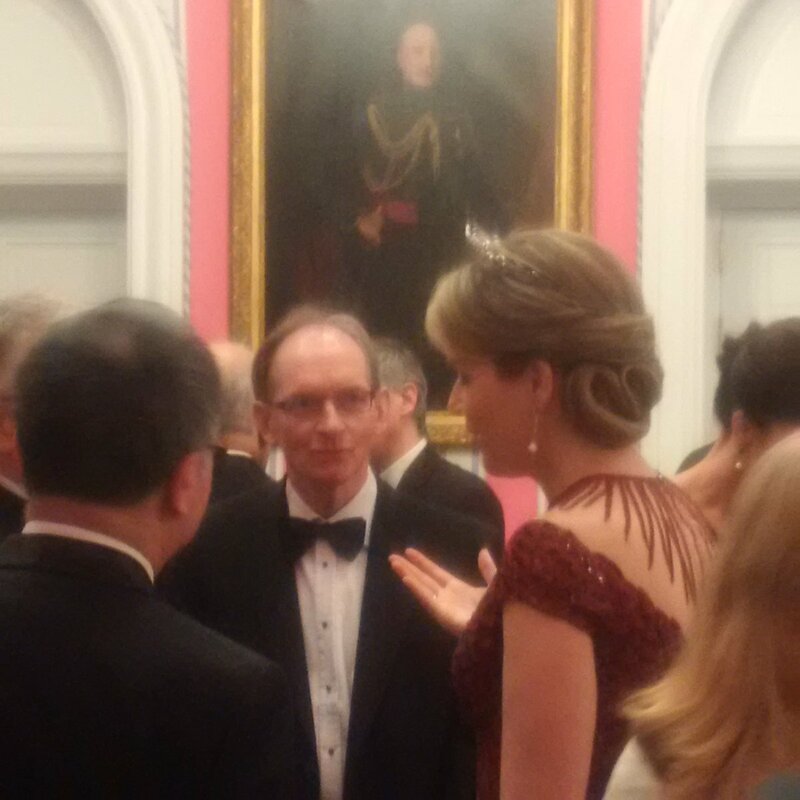 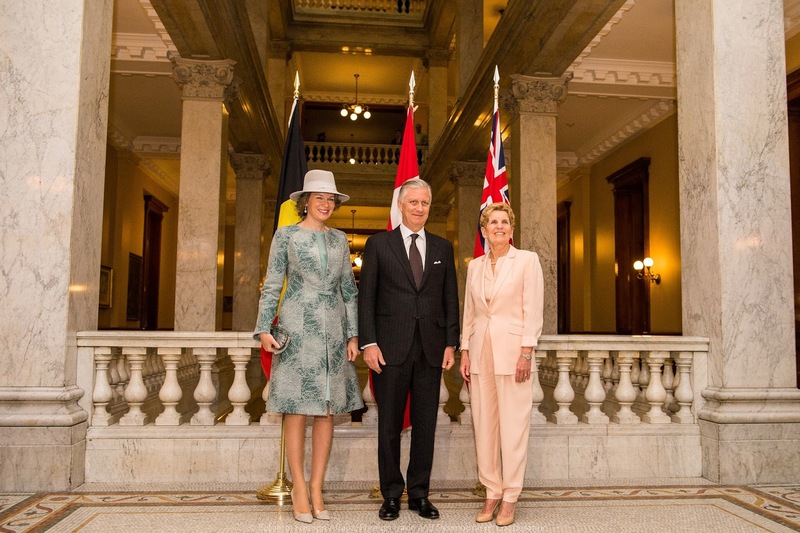 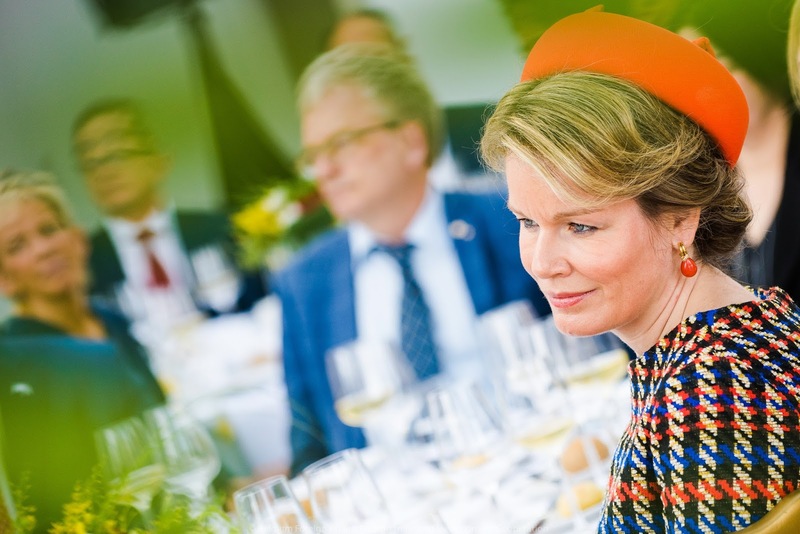 Queen Mathilde attended a high-level lunch on the Quebec-Belgian Science Cooperation. 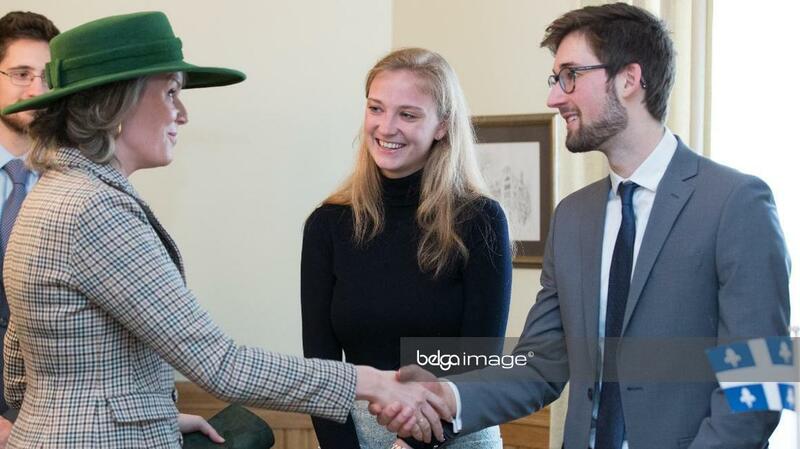 At 14:00 Mathilde attended a meet & greet with Canadian & Belgian students at the McGill University of Montreal. 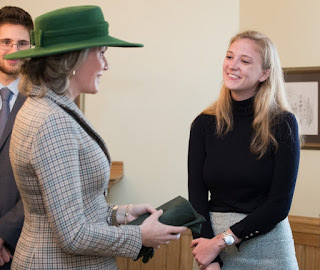 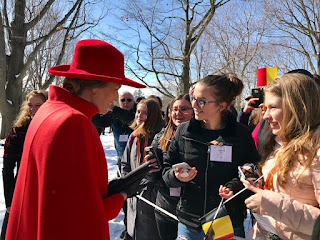 Among the students is her own niece-in-law, princess Luisa of Belgium who's been studying political science at McGill for the past 4 years. 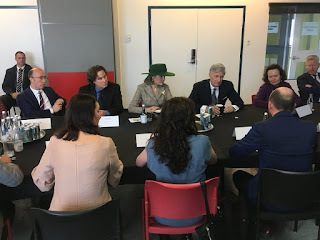 A conference on the Belgian film industry, at the Musée Grévin of Montreal. Informal meeting with the Belgian press. 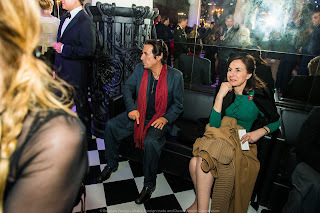 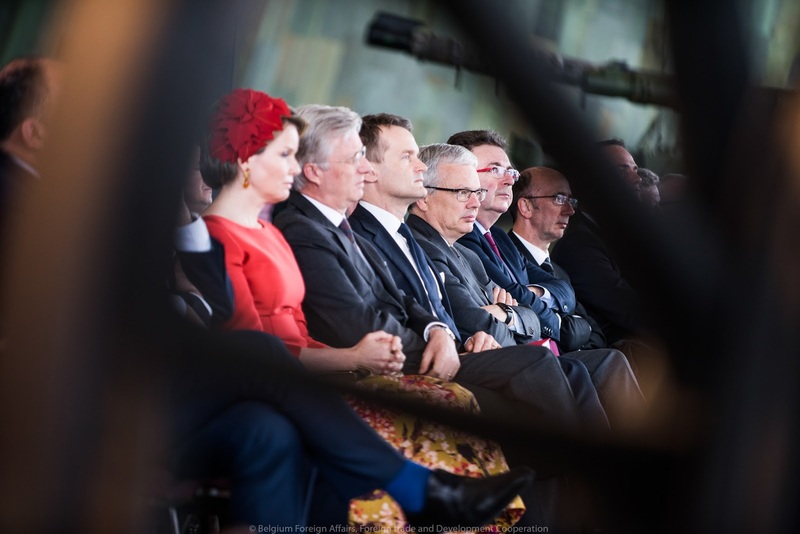 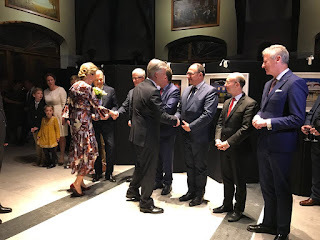 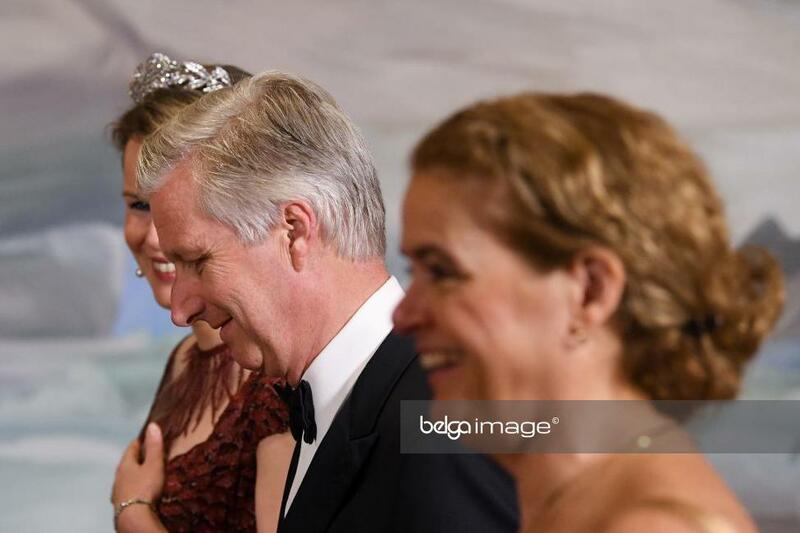 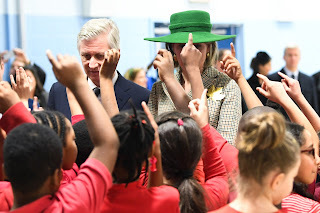 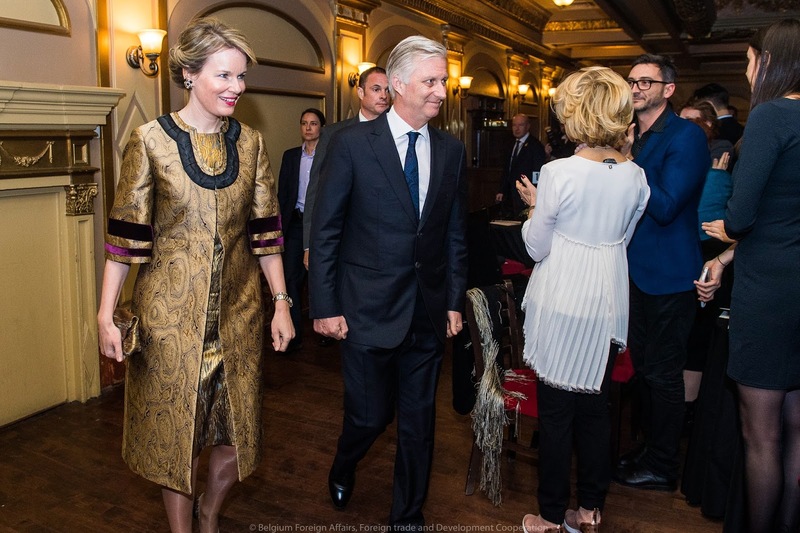 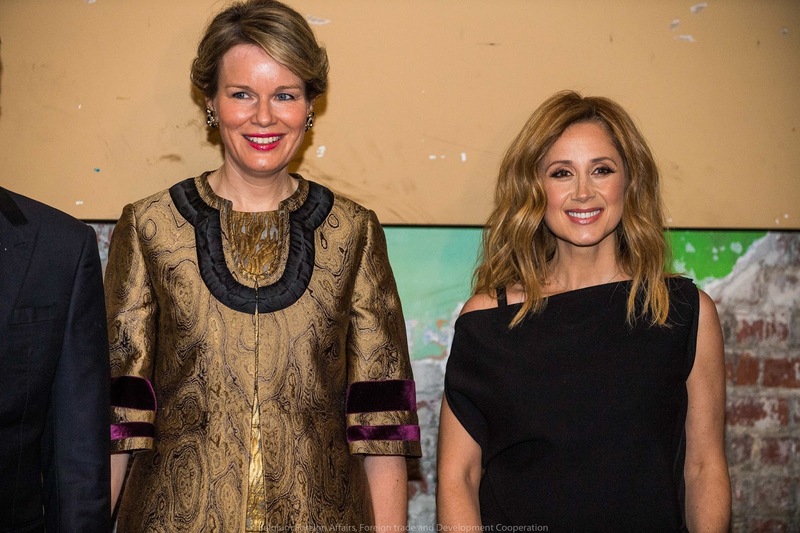 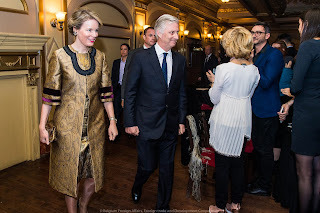 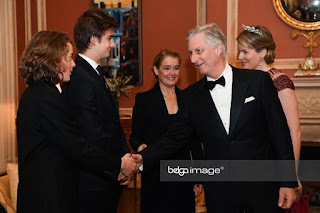 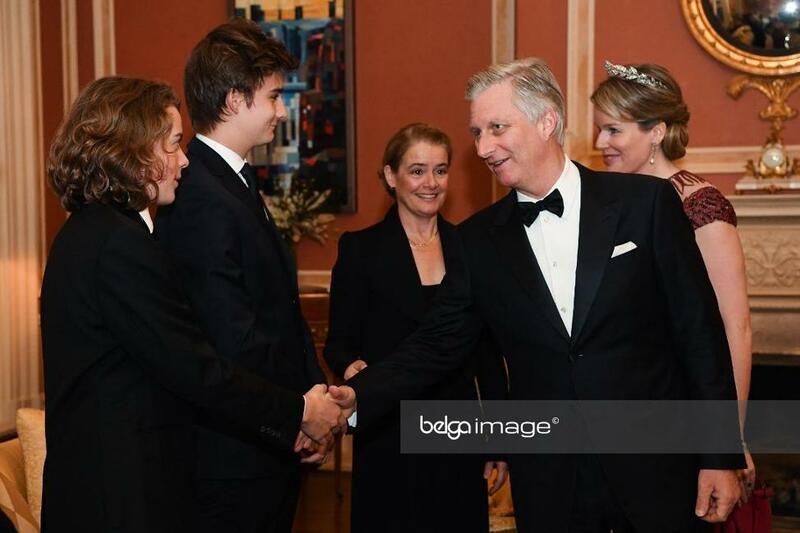 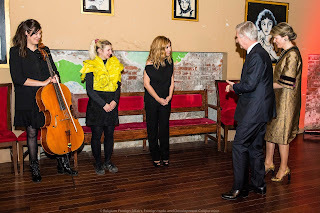 Finally, king Philippe & queen Mathilde hosted a concert by Alice on the Roof & Lara Fabian at Théâtre Rialto. 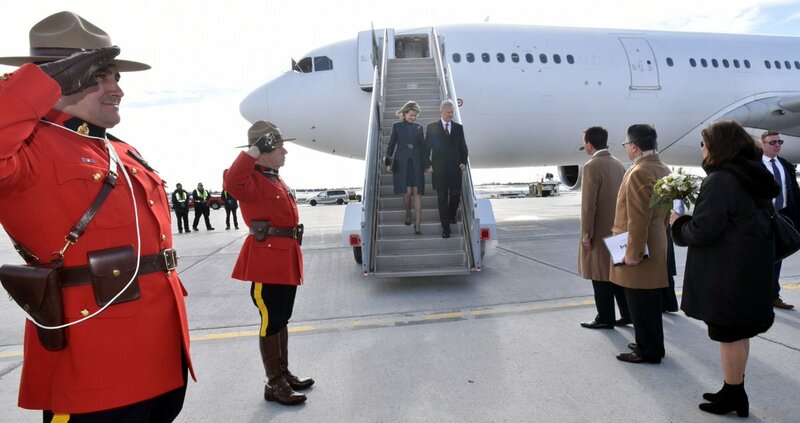 The Belgian delegation departs at 9:00 from Montreal airport for a 6,5 hour flight. 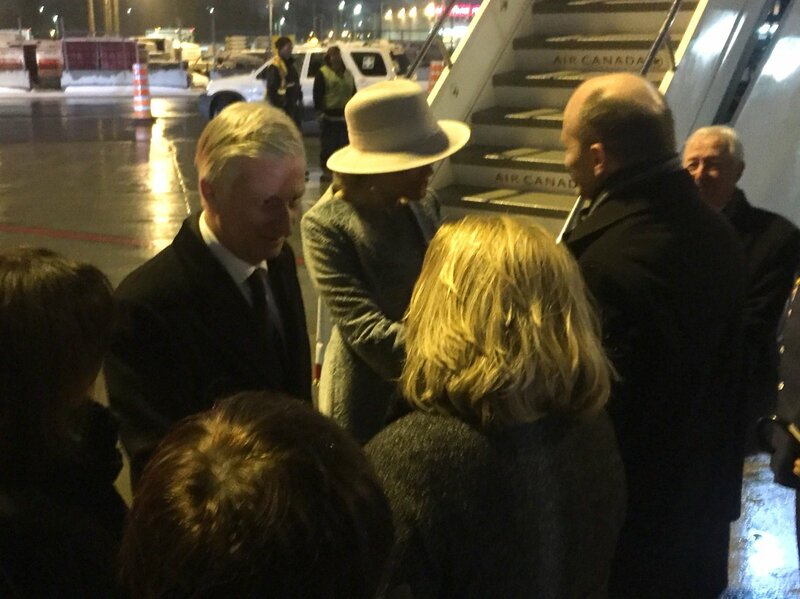 Arrival in Belgium at 20:30 local time.